It’s a good thing that green abalone aren’t prone to sudden jerky movements – especially when you are trying to delicately affix a millimeter-size color coded circle on them using a tiny squirt of super glue. The intensity level rises when the goal is to tag 1,000 sea snail subjects in one day. DON’T SNEEZE – It’s delicate work affixing a tag on an inches-long abalone, now known as orange 22 and orange 23. 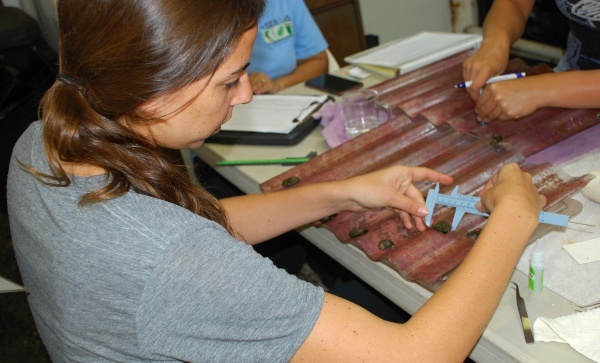 Many hands were doing that recently: working feverishly in a small shed at Redondo Beach’s SEA Lab facilities for this inaugural task; the project will attempt, for the first time, to outplant green abalone raised in captivity into the Southern California marine ecosystem. Among the casual banter and the steady sound of filtered water running, folks were measuring and recording tagged abalone, organizing completed batches and retrieving new ones. HOW BIG? 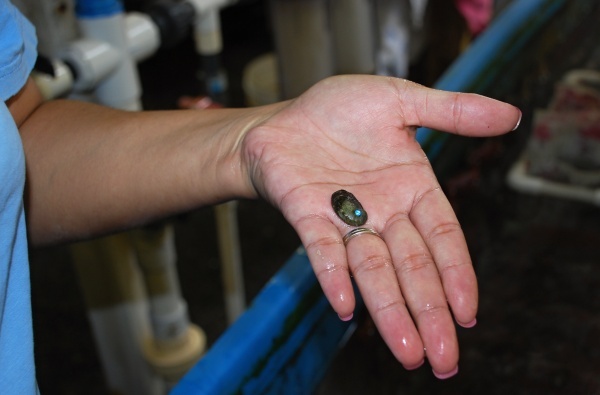 – Biologists will track how these abalone thrive in their soon-to-be ocean home. 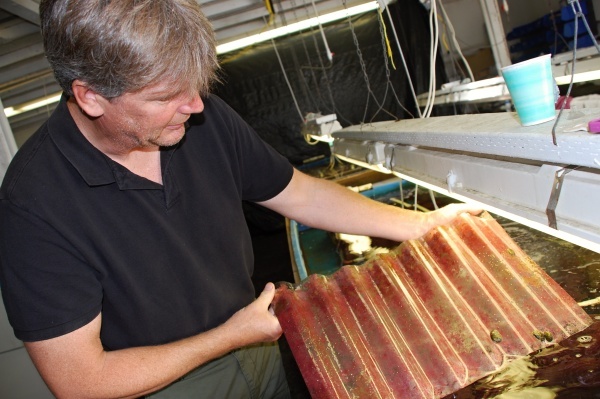 David Witting, a NOAA Restoration Center fish biologist, walked over to holding tanks and pulled out a wavy piece of plastic substrate where 3 and 4-year-old abalone were feasting on red algae, their preferred diet at this age. These youngsters – and hundreds of relatives – were raised at the SEA Lab specifically for this purpose. WHAT HAVE WE HERE?- Dave Witting examines a new batch of abalone to be tagged. YUM…MORE, PLEASE– Hungry sea snails have an appetite for red algae. It took a consortium of effort to ready these older juveniles for their new homes; the new residents will be placed in newly restored kelp forests off the Palos Verdes coast. Joining Witting at the tagging table are representatives from the Montrose Settlement Restoration Program, The Bay Foundation and the L.A. Conservation Corps’ SEA Lab; the overall green abalone program partnership also involves the National Oceanic & Atmospheric Administration, the California Department of Fish and Wildlife, the Nature Conservancy, Vantuna Research Group, California Science Center, and Cabrillo Marine Aquarium. Why all the attention on one kind of mollusk? It’s all about ecology, environment and economics. For thousands of years, abalone flourished off SoCal coastlines; archeologists have discovered 12,000-year-old red abalone shells in the Channel Islands. The Chumash and other indigenous people used red abalone shells to make hunting tools, ornaments and other artifacts. Abalone was also very tasty for European settlers and would become the source of a huge commercial fishery industry in Southern California for decades. It was also a darling of recreational collecting by divers. But over-harvesting in the 1970s, habitat loss and the debilitating Withering Syndrome disease decimated the general abalone population to today’s small communities of certain species. 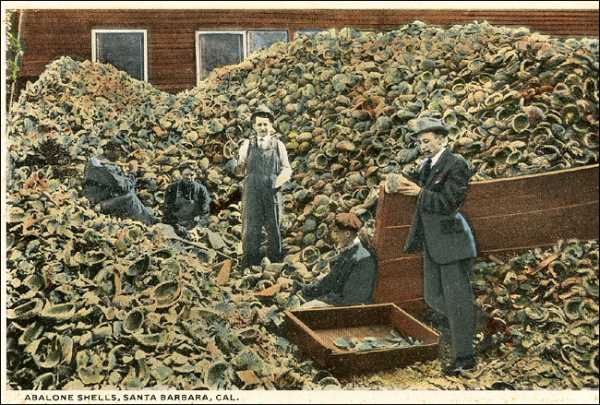 GOOD OLD CAPITALISM — Over-harvesting contributed to the abalone’s near demise in SoCal. 1920s postcard. Witting explains that methods done today to prop up the population of the green abalone could be the future template for restoring white and black species back into the wild. Sea snails that thrive in kelp-laden waters have a dual goal for both nature and man. 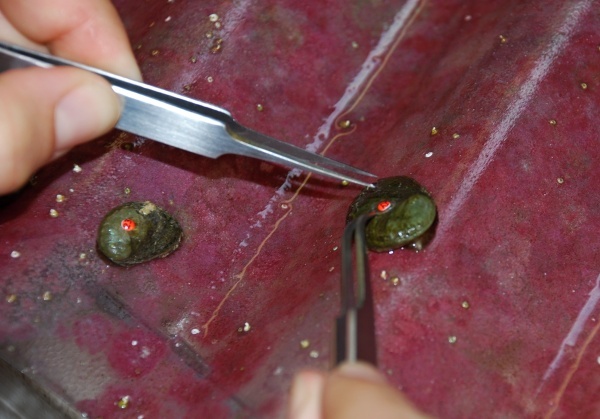 The tags on the outplanted abalone will allow biologists to identify and track their growth and survival rates. If all goes well, these critters will live 20 to 30 years, spawn numerous times, and repopulate their communities. TINY FOR NOW – Green abalone can grow up to 10 inches long. As they continued their delicate tasks, taggers discussed the next steps for these youngsters. They will be transferred into PVC houses where they will be acclimated; soon after, these temporary shelters will be put in the ocean waters. “We have to give them a couple of days to get used to the new environments that we are presenting to them,” says Witting. It’s being heralded as the “Best Whale Watching Season Ever” in Southern California, but what exactly does that mean? Abundant whales? Different species of whales swimming about? Whales coming into closer contact with human observers? Baleen and toothed whales performing their own version of West Side Story? There are many ways to consider what makes a season spectacular. “For me it’s all about the diversity of whales that we can find at any given moment in the waters off of Los Angeles,” says Kera Mathes, marine biologist for the Long Beach Aquarium of the Pacificwho was accompanying a recent whale watching excursion out of Long Beach. 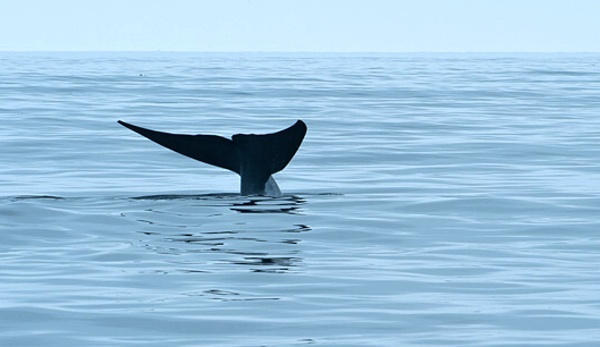 Indeed, rare whale sightings are becoming, well, not quite so rare these days. 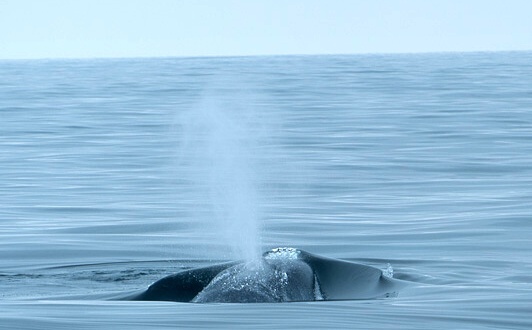 Over the past few months, folks have also seen sperm whales and even false killer whales. “There is a lot of food here that may be bringing those rare species into our waters,” says Mathes about the bounty of krill, sardines and anchovies not to mention sea lions which orcas enjoy. 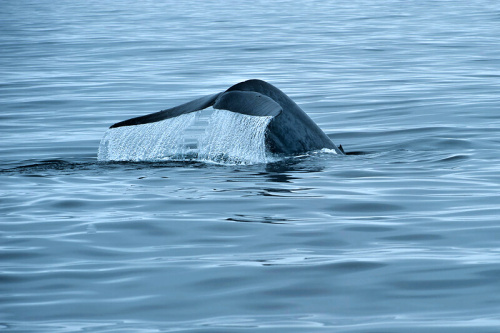 Mathes contends that researchers, however, may also label a season remarkable by the sheer number of whales they are studying. Case in point: the gray whales. Alisa Schulman-Janiger who coordinates that annual Gray Whales Census/Behavior Project for the American Cetacean Society, Los Angeles, has been regularly posting the phenomenal numbers of gray whales spotted at Pt. Vicente Interpretive Center by trained on-shore volunteers. To date, 385 grays – that includes moms and babies – have been counted going southbound to Baja in the month of December. That number has broken all records since the census began in 1984. On this particular whale excursion, two individual grays were spotted. One whale had a craggy notch near her fluke indicating she was a victim/survivor of an entanglement which carved out a deep chunk of her flesh. 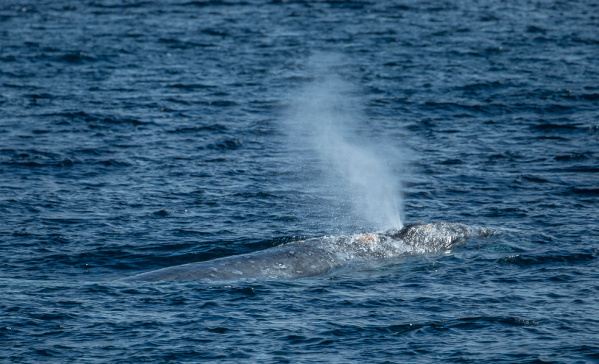 Photos taken from the whale watching boat were sent to researchers – including Schulman-Janiger who later identified the whale as the same one she photographed in 2009. Those current photos will be sent to watchers in Baja Mexico in order to track that whale’s path and behavior. Mathes says the aquarium partners with various researchers, supplying them with “opportunistic data” about specific whale species. Photos are vital components – researchers match flukes (as individual to whales as thumbprints to humans) to follow a specific whale, like this wounded one. The craggy notch wound, however, didn’t seem to stop this particular whale; she was swimming at a good pace, blowing, diving and deep diving for krill and other goodies from the SoCal buffet line. 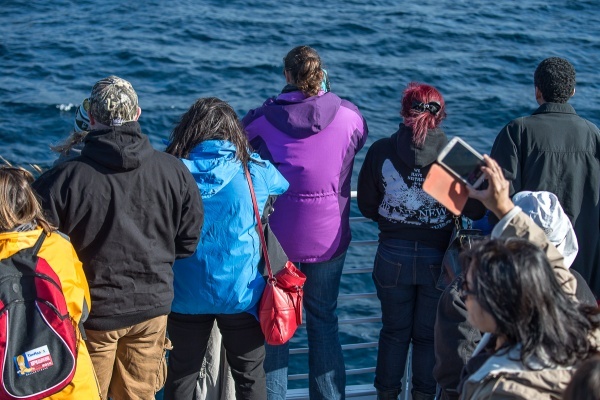 Record whale numbers of any kind (“this year we have seen more humpbacks than we have ever seen in our 15 years of whale watching boats”) means an exciting experience for Salas’ guests, many who maybe making the trek for the first time. But you actually may see this (which is still cool, but not as dramatic). Be advised, too that whale watching is often more whale WAITING. When the captain hollers “Thar she blows,” be prepared for the paparazzi of camera clicks as the whale briefly slides up and out of the water. Thank goodness for dolphins (which are small whales) that can be counted on for stealing the show on any whale watching excursion. Bounding up and out of the water with spectacular spiraling leaps and spins, these marine mammals certainly embody the joy and freedom of the ocean. 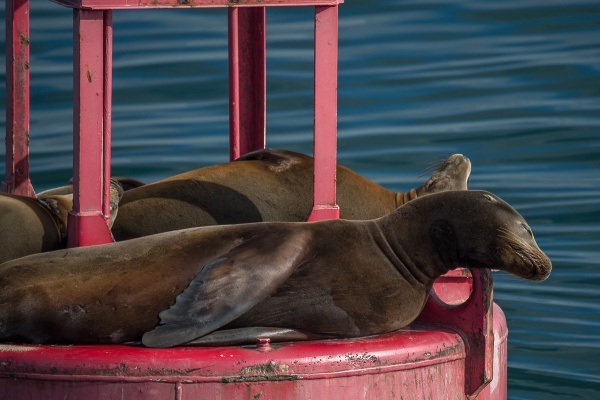 On the flip side, many whale watch trips include the traditional drive-by the buoy covered with snoozing sea lions. While dolphins show off their acrobatic side, the sea lions (equally energetic in the water) are content to display their relaxed, groovy and mellow personalities, giving humans a small taste of multifaceted life in the wild Pacific Ocean. RARING TO GO — Students try to contain their enthusiasm. Wiggling, fidgeting and anxious. 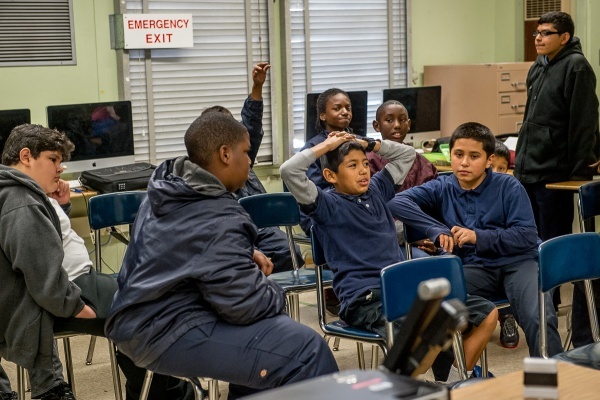 The sixth grade class at Sun Valley Magnet Middle School were painfully waiting their turn to step to the front of the class. They tried to contain their nervous energy and nearly lost the battle. Busting at the seams? An understatement. One by one, groups of three and four came forward in front of fellow classmates and students from neighboring classes. The Science Dudes, The Animal Finders, the Bobcats and more. Each group had a presentation that, while similar in topic, reflected different facts, personal narratives, and elaborate Powerpoint flourishes. “Urban sprawl affects our indigenous animals,” presented one student while an image of a bobcat on a tree flashed on the board. PRESENTING THE PROBLEM – The Science Dudes discuss the benefits of a wildlife corridor. Most presentations were electronic but one group, the Thunder, created a handmade model of what a proposed wildlife corridor would look like. Plenty of cardboard, construction paper, milk cartons and glue were put into the model that depicted a green bridge spanning a concrete freeway with buildings off to the side. 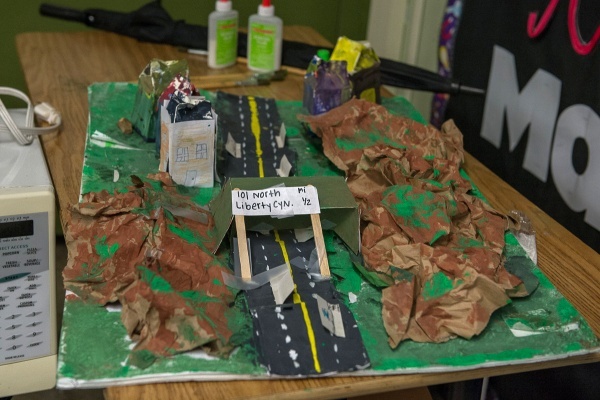 HANDMADE CORRIDOR – The Thunder created a vision representation of the Liberty Canyon overpass. 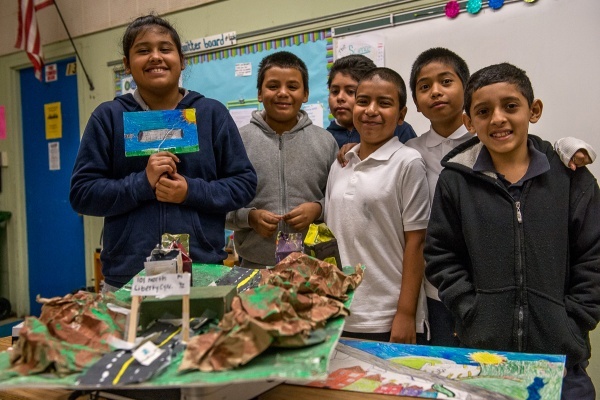 Using a real-world example of the current wildlife corridor fits in well with the Project Based Learning (PBL) that’s the norm at this Environmental Studies Through Arts Academy magnet school. The Wildlife Corridor lesson was more than two months in the making and involved vocabulary words, research on the internet, interviews, a trip to the Natural History Museum and, perhaps the most inspiring aspect, a tour of Liberty Canyon with Anne Dittmer, CSUN professor who is intensely interested in the proposed corridor. In addition to touring Liberty Canyon, Professor Dittmer brought the youngsters to explore nearby Malibu Creek to understand the landscape – which is home to many critters that could potentially use the corridor. 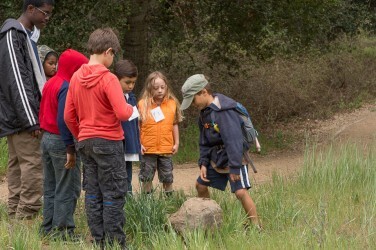 ACTIVE DISCUSSION — Students think and talk about local wildlife. As always, questions were bountiful. 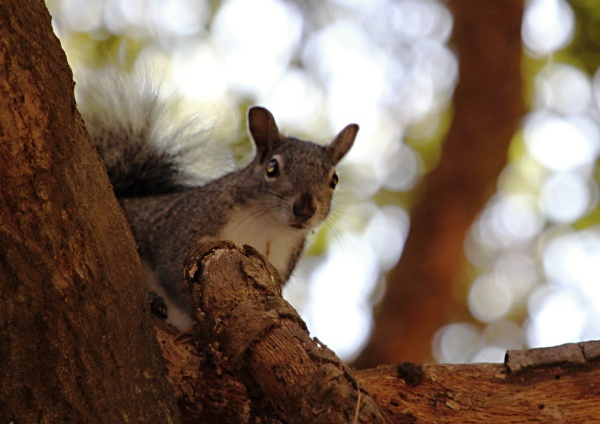 Students knew the sad story of seeing dead animals on the street – raccoons, squirrels, even birds. Many advocated in their presentations that adults (including parents) should drive cautiously when they know that wildlife is around. Still, even with careful human eyes, that doesn’t mean a critter won’t take a chance at crossing. Yes, the ways of nature can be hard to grasp, but this fact sealed for the student’s the pressing need to establish the corridor. 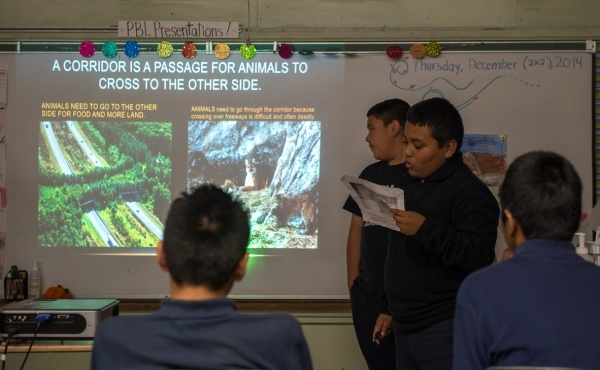 BLUEPRINT FOR A SOLUTION – Students realize how valuable a wildlife crossing over Liberty Canyon would mean to humans and critters alike. Finally. 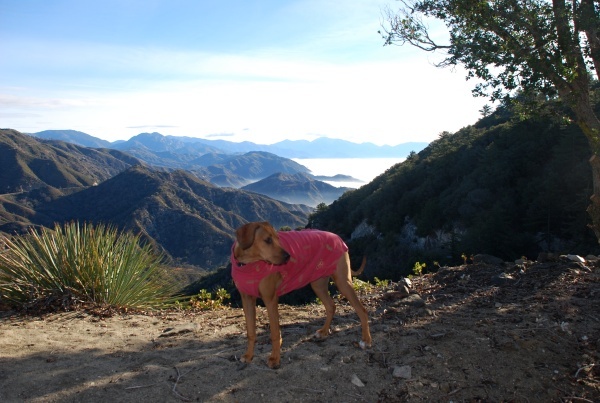 A SoCal forest that’s been lying in ruins since the 1950s is getting proper attention and love. Not a trees-on-land forest; this SoCal oceanic giant kelp forest off the Palos Verdes Peninsula coastline represents seaweed at its finest and is a testament to the power of nature to rebound after devastating decimation. 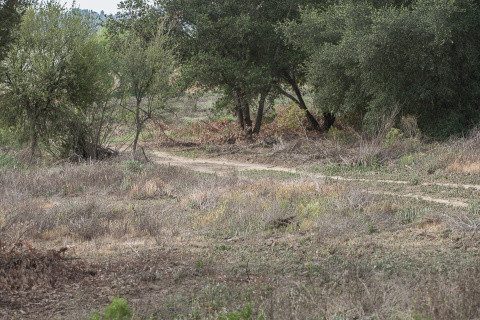 It’s estimated that this PV Peninsula forest has declined 75 percent in the past 100 years — but things are about to change thanks to a five year program headed up by The Bay Foundation (TBF). 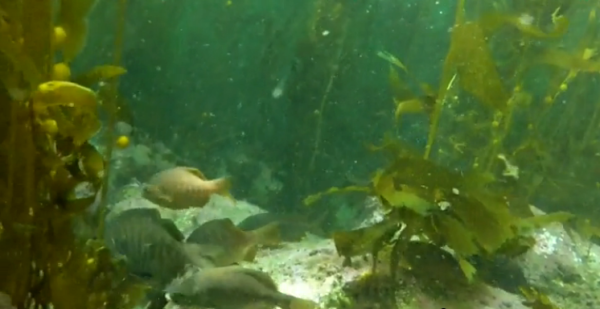 Thanks to a hodgepodge partnership of trained volunteers, nonprofit organizations and fishermen associations along with federal and state agencies, the Palos Verdes kelp forest is once again thriving and beckoning local wildlife. At last count, more than 700 wildlife species including fish, crabs, sea birds, arthropods, sea lions and more, depend on the flowing undulating fronds of this ocean plant – and divers are now seeing many of these critters (such as the kelp bass, garibaldi, California sheephead, California spiny lobster and the two-spot octopus) returning. 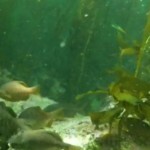 CHECKING OUT NEW DIGS — Fish swim the newly restored kelp forest in the PV Peninsula. “Rich, fat and happy,” is how Tom Ford, Executive Director of TBF describes the giant kelp plants that have taken root and sprung upward 30 feet to the surface. Ford explains that because the kelp has grown so quickly (the plant can grow about 2 feet a day), much of the new kelp has spread across the top of the water thick and strong enough to support hungry egrets walking searching for a slippery snack. 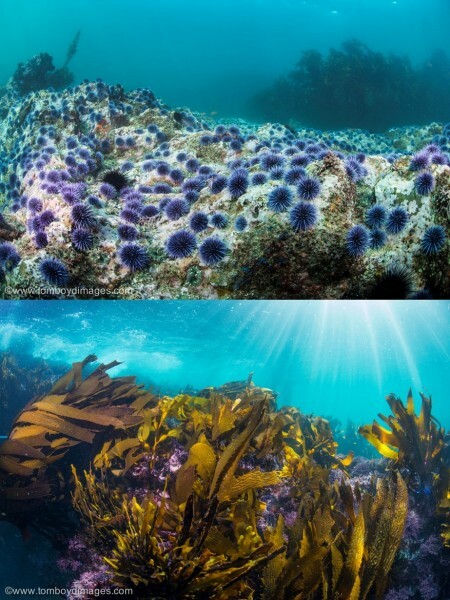 NIGHT AND DAY — An urchin-choked landscape before restoration (top) and healthy kelp regrowing after restoration (bottom). Photos by Tom Boyd. And guess what? It’s only been less than a year that this remarkable transformation has taken place, proving that nature doesn’t need complicated programs or intricate procedures to replenish what was lost. Often, the right jump start gives nature all it needs. At one time, kelp so thick and tall was the norm in Southern California and provided many a marine critter home, food and more, but the post WWII building boom brought pollution, urban and storm water runoff, non-conservationist construction practices and sediment unceremoniously dumped into the ocean. The kelp choked and wildlife left, except for scrappy sea urchins. With no kelp, the urchin’s natural predators – spiny lobsters, California sheephead and sea otters – disappeared leaving the urchins to multiply like crazy creating barrens which crowded out most other sea life. The resilience of the kelp helped the divers who didn’t need that extra step of planting plugs and starting the kelp from scratch. The kelp was just waiting for room which allowed it to spring up. Project partners include: California Sea Urchin Harvesters, Vantuna Research Group, National Oceanic and Atmospheric Administration (NOAA), Department of Fish and Wildlife (DFW), Southern California Marine Institute, Los Angeles Waterkeeper, California Science Center, and TBF. This is only the beginning. Only 12 of the 150 acres were part of this initial project and work will continue for the next four years to complete the transformation. Along the way, scientists and researchers will monitor the kelp growth and the return of wildlife. Ford says that the Santa Barbara and Anacapa Islands are next in line for local kelp restoration but that researchers in British Columbia, Japan, Iceland and France are keenly watching the SoCal progress and will apply the same methods to their own kelp restoration projects. COMING SOON? 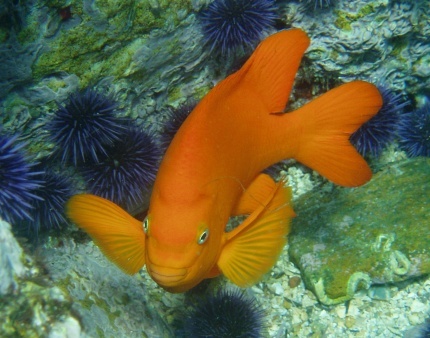 – The California State Fish, the garabaldi, could soon be a local resident off the PV Peninsula. Indeed, Dagit and her cadre were tasked with weighing, measuring and cataloging the fish that were caught as part of the first ever Friends of the Los Angeles River (FoLAR) “Off tha’ Hook” fishing derby. The catch and release event took place on September 6 which was designated as one of the “free” fishing days (aka no license needed and therefore open to all) from California Fish and Wildlife the entity that governs fishing on the river. 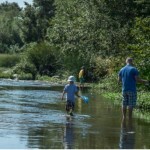 FoLAR organizers say that the derby strengthens the vision that the river is a living, breathing entity worthy of recreation, wildlife viewing and, yes, fishing. 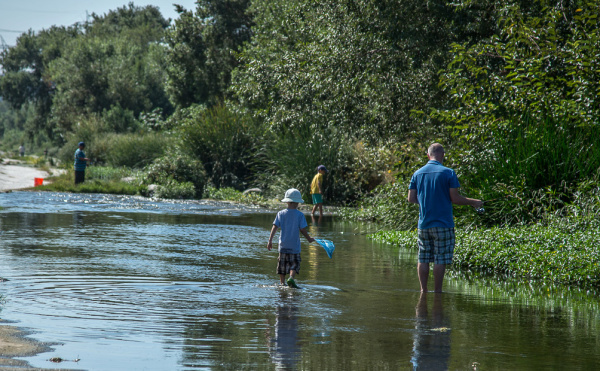 Members of the Los Angeles Rod and Reed Club were on hand to show off their fly casting prowess– some actually hiked up the waders and make it an immersive experience. 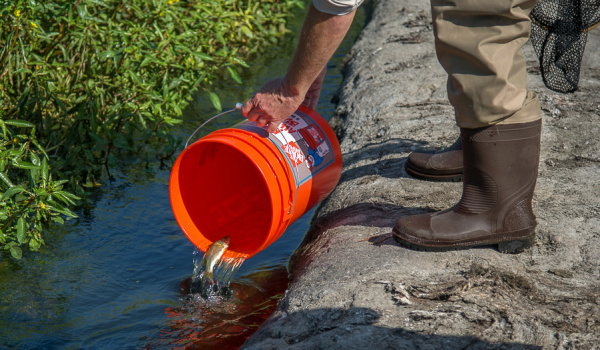 THE WATER’S FINE — Who needs hip waders? There was an official contest (most fish caught, biggest catch) but that was just an excuse for fishing folk to be out in the picture perfect postcard early morning. Anglers casted off amidst the lush river surroundings with horseback riders on the Griffith Park hills in the background. Birds swooped over the water – Canada geese, mallards, black-necked stilts along with assorted shorebirds and immature egrets. Deep in the river bank, you could hardly tell you were in one of the world’s largest cities. WHERE ARE WE? — Oh yeah, right next to the 5 Freeway…. Helping Dagit compiling the data was Sabrina Drill, Natural Resources Advisor for UC Cooperative Extensive who worked on the FoLAR 2008 fish study in the L.A. River. That study was eight days long and involved four locations. The fish most seen from that study? Mosquitofish, tilapia and green sunfish. “Of course our methods for catching fish were different today,” she says describing how using a drag net yields different fish than using a rod and reel. Its bottom feeders vs fly catchers. That was evident by the fish caught at this derby – one large carp and the rest were large-mouth bass, albeit on the small size. CARPING AROUND — The first official fish of the contest was a big ol’ carp. 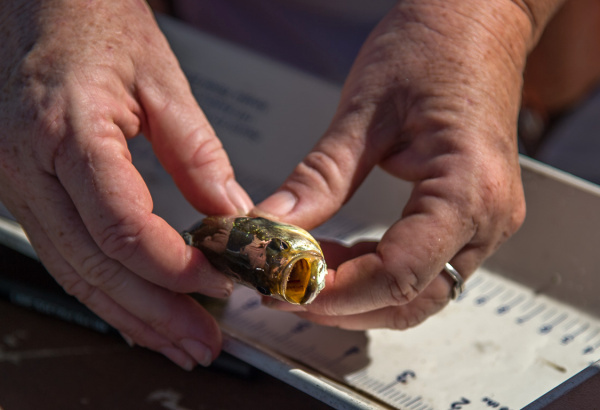 OPEN WIDE – Large mouth bass were the fish most caught at FoLAR’s Fish Derby. Dagit spends a lot of energy patrolling the coastal streams for the steelhead trout; that fish used to be found in the Los Angeles River along with arroyo chub, stickleback and maybe even speckled dace. 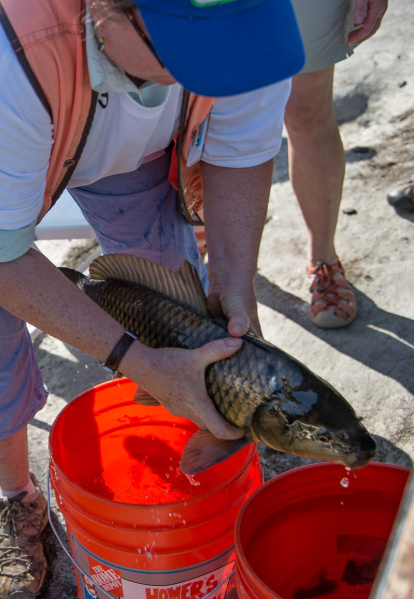 BACK YOU GO — All fish caught at the derby were released back into the L.A. River. 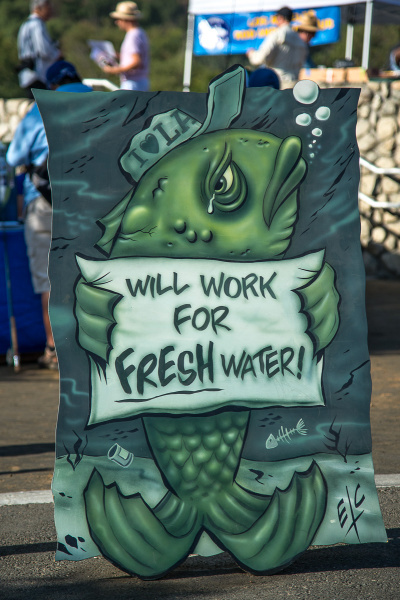 Both Dagit and Drill are enthusiastic but realistic about seeing a bounty of fish return to the L.A. River. Right now, there are too many physical barriers (not to mention dam gates) that would prevent the ocean–swimming trout to make its way up freshwater streams for spawning. Still, that didn’t stop folks from sporting t-shirts that declared, “Fishing for carp, waiting for steelhead” in anticipation of the return of that historic trout. On that day, one could imagine heading down to a river that could be alive with flapping fins and rainbow scales. Stay tuned. Stranger things have happened. 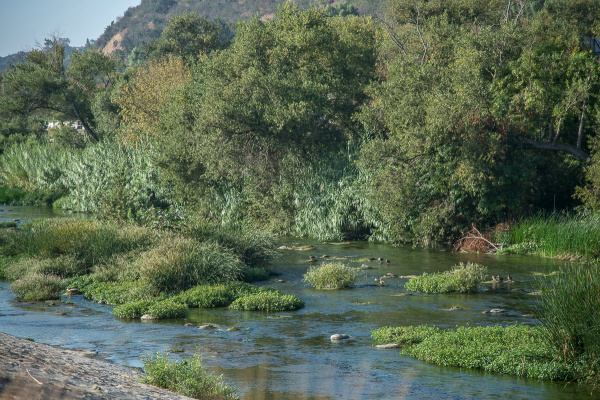 NOT EASY LIFE — Fish in the L.A. River can survive…but more work needs to be done to make it a better environment. One after another, cars arrive as if on cue. 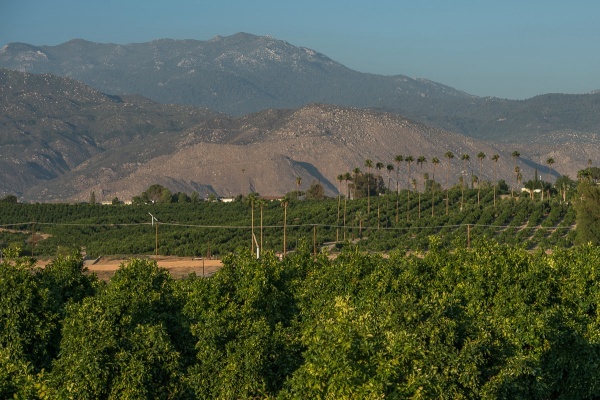 They pull over on the shoulder of this two-lane highway near an endless orange tree grove here in Valle Vista on the outskirts of Hemet in Riverside County. “They” are bats, Mexican free-tailed bats to be exact. Underneath this small bridge probably tens of thousands of the flying mammals are getting ready for their nights’ forage of insects, drawn to the sweet smell of orange. 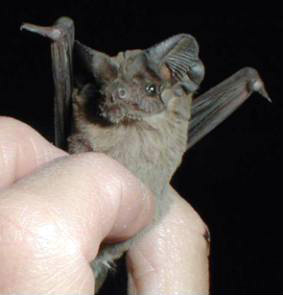 Close up of a Mexican free-tailed bat. PHOTO: National Park Service. Home to the largest bat colonies in the area, this nightly bat swarm is one of Southern California’s amazing natural wonders. Valle Vista’s bats haven’t achieved the notoriety of Austin, Texas’ Congress Avenue Bridge (those too are Mexican free-tailers), and maybe that’s a good thing. The easy good-natured camaraderie of fellow bat watchers (some bring folding chairs and snacks), the unmarked location, the agricultural small-town road – all make sharing anticipation with fellow strangers a goose-pimple experience. When the fall cold hits (usually late September/October), all bats return to their Mexican caves and dream again of the Californian insects come the following summer. “They’ve been recorded there since the 1990s,” says Dan Taylor, a bat biologist from Bat Conservation International who adds that it’s not just this bridge, but two others that the free-tailers use for their summer vacation. All in all, it’s estimated that more than 20,000 bats are part of this extraordinary colony. Walking over to the bridge before the big show, two things are apparent: a steady din of bats chirping/buzzing to each other (“Wake up!” “Five more minutes!” “No! Now!”), along with the overpowering smell of bat guano on the cement floor below. “That smell is like fertilizer with a kick of fruit punch!” remarks one bat waiter. By now, more folks have arrived, many armed with cameras and cell phones. 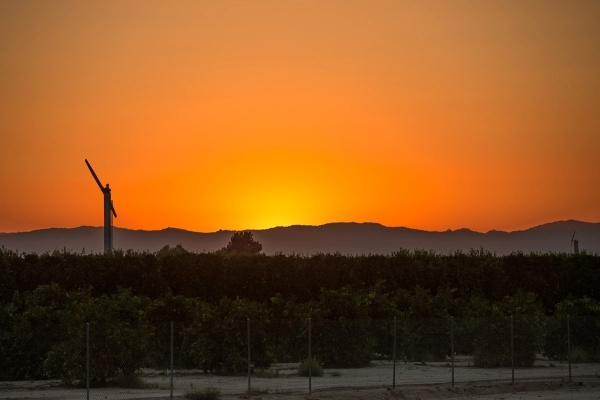 The sun reaches the golden line in the horizon at the far west end of the San Jacinto Valley and the first bat (a scout?) flitters out to test the air. Finally, the flag is dropped and the bat signal is given. Tiny flappers zig and zig out from the bridge into a swirling living cloud high above the orchard. 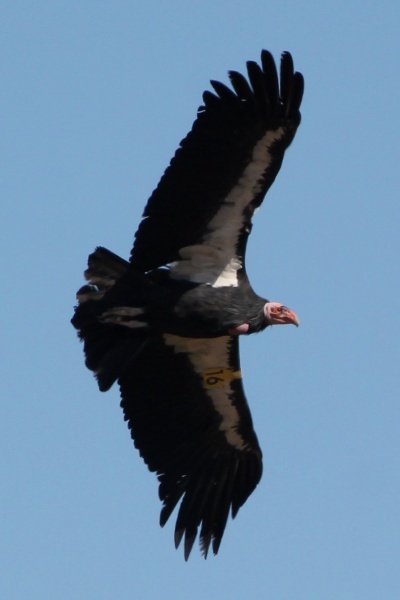 They can fly 20-30 miles per hour and reach heights of up to 10,000 feet. “These guys are the jet fighters of the bat world,” sums up Taylor. 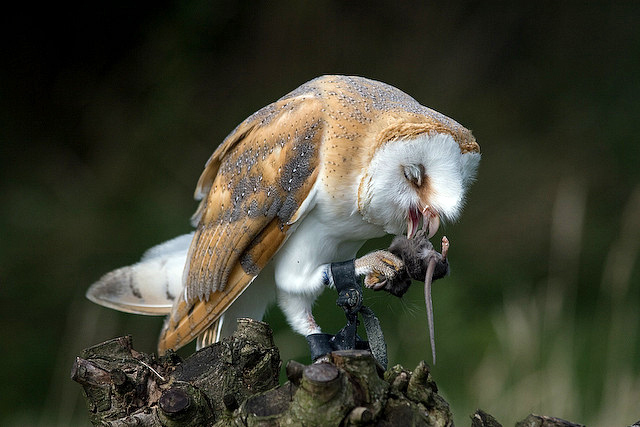 THE RACE IS ON – Who can eat their weight in insects first? The parade continues with more bats emerging into the coming darkness. Instead of a loud flapping, these bats are quiet fliers, hitting the air with a velocity that’s purposeful and powerful. Finally after less than 10 minutes, the last of the flappers leave the bridge empty for the night. Traveling up to 100 sq. miles in a single night, these bats will consume their weight in insects and then return to this bridge to digest, huddle and sleep. Summed up in one word: Bat-tastic. The Fairview Avenue Bat Bridge is located east of Hemet in Valle Vista between Mayberry and Stetson Avenues and South of Highway 74. 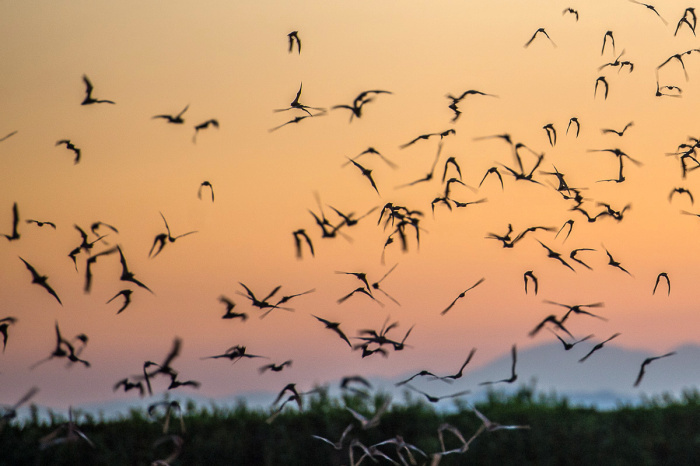 WAKING UP – Bats start the evening off in a swirling living cloud. The students were breathless. “Mr. Rumble! We saw something in the bush! 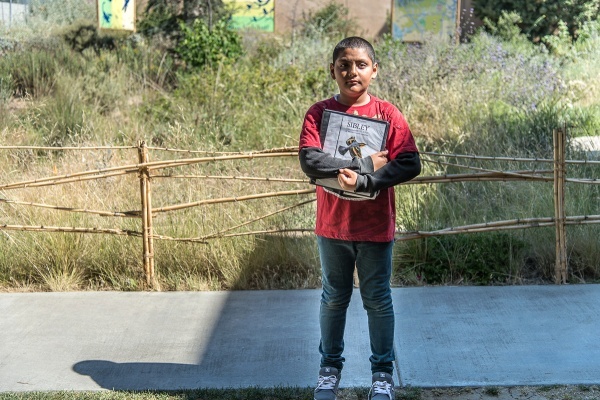 Come quickly!” Bradley Rumble, principal at Leo Politi School near downtown Los Angeles was intrigued and followed the fourth graders out of the outdoor shady area into their once concrete-and-Bermuda-grass-plot-now-turned-native-plant-and-wildlife-habitat. 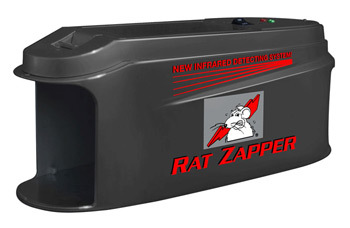 After all, there *could* be a critter out there. It’s not unusual in this 5,000 sq. 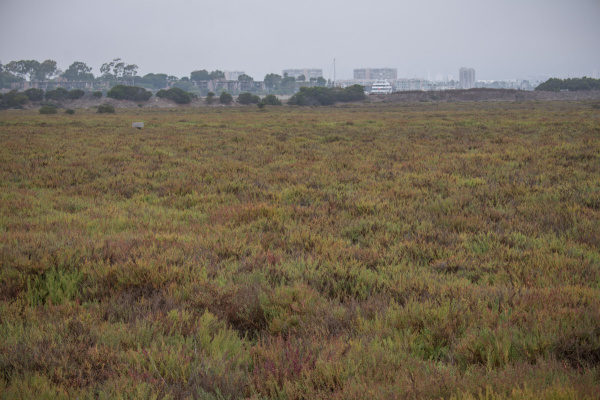 ft. plot for students to encounter wildlife among the bladder pods, salt bush, buckwheat and coastal oaks. It’s been four years since the garden celebrated its “Plant Day” and the old saying “If you plant it, they will come” has rung true here in this urban neighborhood. Notable birds like the Western meadowlark, Cooper’s hawks and yellow rumped warblers have been seen here along with the regulars: Little Leo (an Allen’s hummingbird that pays homage to the school moniker), carpenter bees, monarch butterflies and American kestrels. 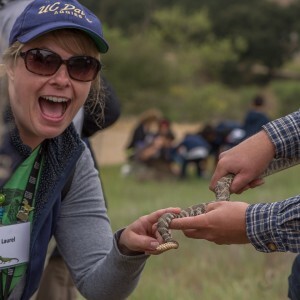 A while ago, students –and adults – thought they spied a slithering alligator lizard but that wasn’t completely verified. SKREE-FLOP! The rubber snake leapt out and made everyone – but especially Rumble – holler. 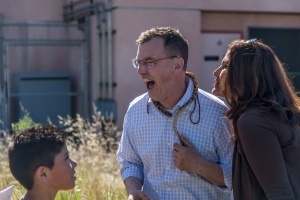 Shrieks of laughter erupted and Rumble good-naturedly embraced the prank. “Oh, you guys are good! That is a classic!” he told them as students grinned ear to ear. Fourth grade teacher Linda Dowell explained that this joke had been planned for a long time. “Welcome to our school!” she exclaimed. 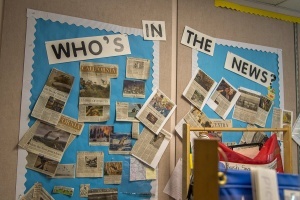 Indeed, the culture at Leo Politi is inviting on many levels – it’s a school that many adults probably wish they could have attended back in their day. 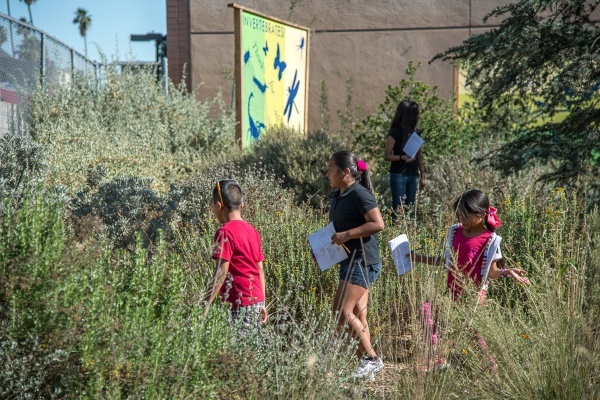 This outdoor habitat, used practically every day by students of all ages and their teachers, is the connector that fuels much of the education query…but that’s just the beginning. After the excitement of the joke wore off, the students are back to their booklets, making observations, writing and drawing pictures of their favorite plants and checking the micro-habits (carefully placed rock piles) and bee house for new residents. 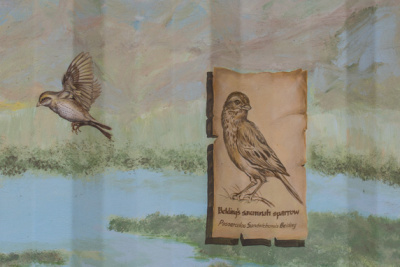 Later, students may spend time in the Audubon Classroom where cross curriculum studies connect art, poetry, current events to science, nature and local wildlife. Second graders are learning such vocabulary words as: limited exposure, carcass, toxic element and extinction. 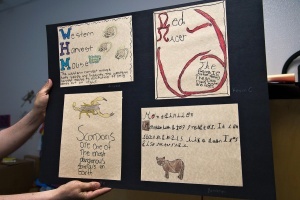 Older students study the history of scientific drawings that include cave drawings, illuminated manuscripts and the bathysphere. 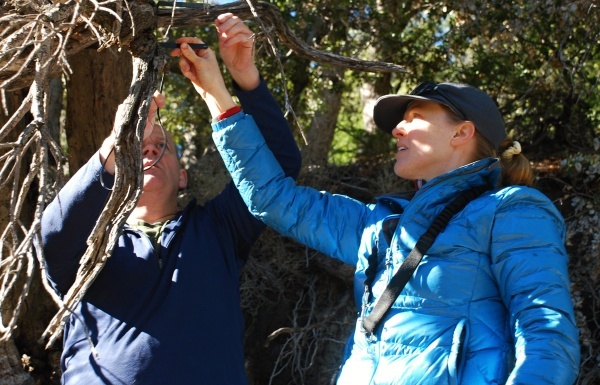 Here, studying the intricacies and diversity of the natural world isn’t just for youngsters – it’s a serious endeavor that takes its cue from the learning laboratory growing in their own back yard. At the school, science scores have gone from 9 % proficient, 0 % advanced in 2009 to a healthy average of 47 % proficient/advanced. In 2005, 11 students were identified as gifted; in May 2013, 95 were in the gifted program, more than 10 percent of the school. It did take a village to create this outdoor habitat. 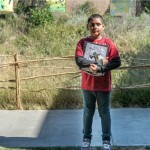 L.A. Audubon worked with the school to receive aSchoolyard Habitat Restoration Program grant through the U.S. Fish & Wildlife Service. They also received a grant from Toyota’s Together Green program. Restoration ecologist Margot Griswold and the students at Dorsey High School were on board to help students/faculty study soil samples and determine the school’s ecological location in the LA watershed (coastal sage scrubland) along with prepping the soil and final planting. Parental involvement was instrumental. 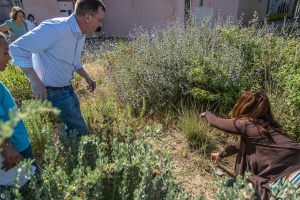 “Native plants are a lot of work to establish,” says Griswold who regularly visits the school to see what’s growing – and that’s not just the plants, but the students also. “We are starting to see the links between providing students these kinds of learning opportunities to higher education,” she says explaining how a recent Politi grad has now enrolled at Dorsey High and joined the Eco Club. 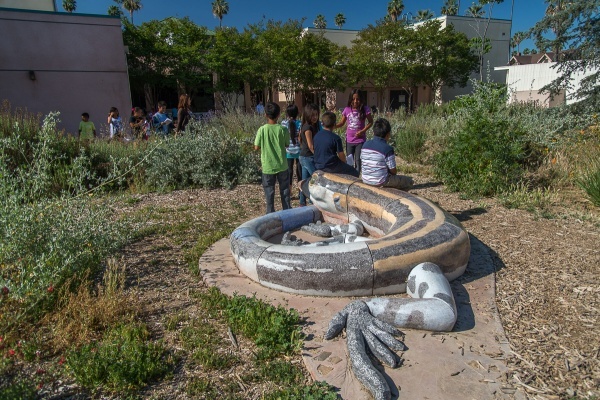 Griswold is part of the LAUSD Instructional Schoolyards Task Force that will next month offer recommendations on how schools can create outdoor learning centers, much in the vein of what goes on at Leo Politi. Maybe one day school habitat gardens will be a normal part of every school’s campus, just like swing sets and lunch tables. Currently, 400 out of 800 schools in the Los Angeles Unified School District has some kind of green space, be it a vegetable plot, garden or boxed planting area. 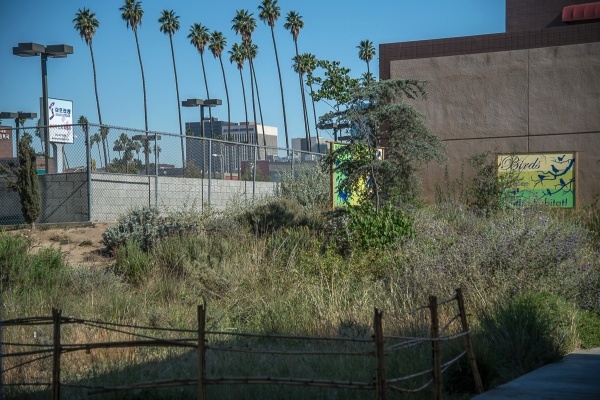 Chief Facilities Executive Mark Hovatter is excited about the way schools are incorporating gardens in Los Angeles but says that many of these habitats are dependent on certain volunteers. 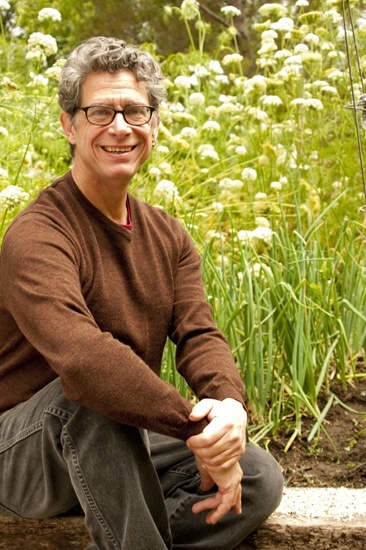 “The problem comes when those volunteers move on, and then the garden disappears,” he says. A new program Sustainable Environment Enhancement Development for Schools (SEEDS) kicking off this June aims to provide schools with resources as well as partnerships to keep green spaces going. “Science doesn’t belong only to the people who go to school for it, today, it’s available for everyone to become a citizen scientist,” says Denis Callet, a Montrose-based photographer, as he hikes up a secluded trail in the Los Angeles Forest. 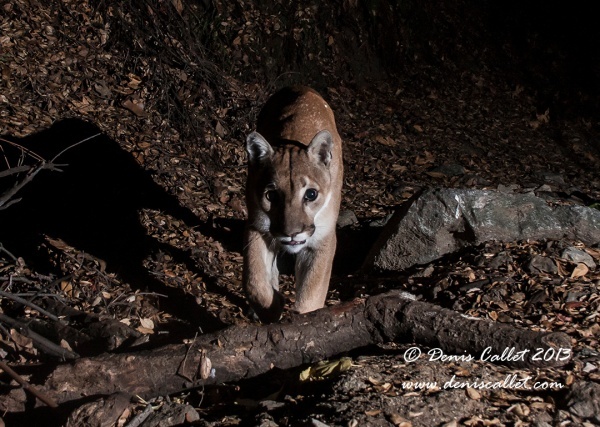 It’s bright and early on a Saturday morning and Callet is joined by fellow outdoor enthusiastic, Johanna Turner who has been recording trail cam images of SoCal mountain lions, bobcats and other local critters since 2007. Turner’s well behaved dog Ripley joins the duo who connected about two years ago through their fierce love of local wildlife. Callet and Turner wouldn’t have met in their normal 9-5 world; he works retail and she’s in the entertainment business. 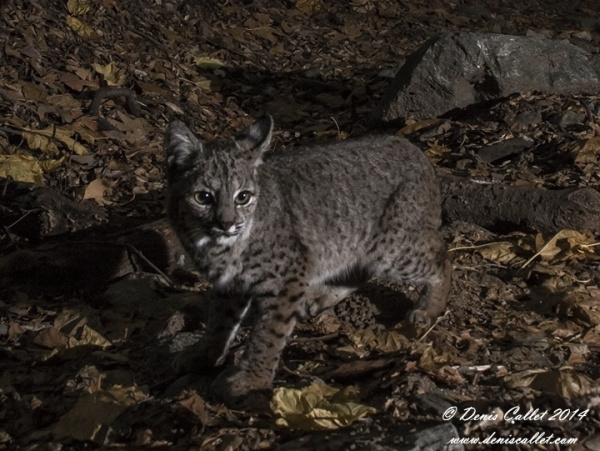 But together they are slowly transforming the science of the trail camera – now a must for any outdoor research biologist – into a template for art. Today, the two are hiking to check their four cameras hidden in the forest; they also have cameras in remote local areas. 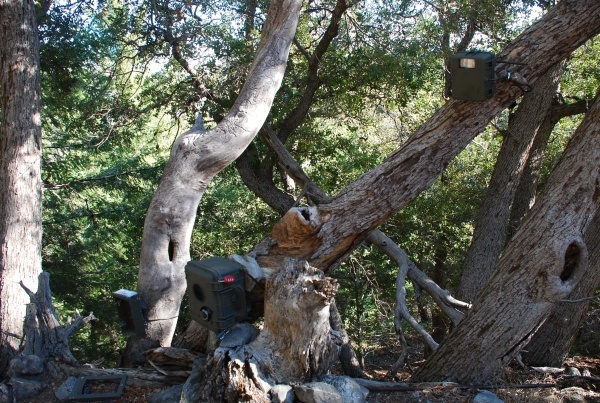 Sure, they have the standard Bushnell cameras that collect video images, but these camera trappers are anxious to see is what Callet’s homemade DSLRs – which yield high quality color images – have clicked in the past two weeks. Callet and Turner each carry big backpacks full of equipment, hardware, batteries, cords, zip-ties, duct tape and more. Turner also carries her laptop so the two can check on how the cameras are positioned, if the lighting, sensors and triggers are working, etc. etc. 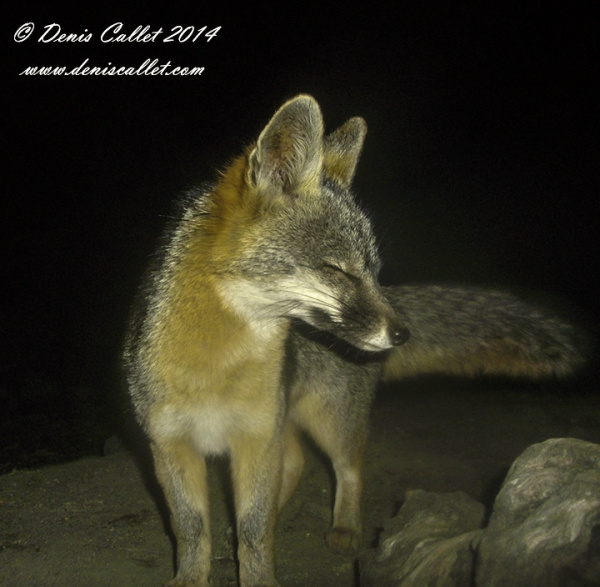 It’s hard to gauge what’s the main topic of conversation on the trail – the refinements they are going to make to the camera and camera set-up or the wildlife that surrounds them. Big ticket cameras are “not in our budget; we’re not using top of the line stuff,” says Turner about camera trapping that was original marketed toward hunters and landowners. But Callet’s prowess with photographic equipment and his MacGyver-like ability to jerry-rig pieces and parts (“eBay is a very, very, very good thing,” he says) is yielding fantastic results. “He’s so picky about the images, things that I think are wonderful, but he wants them perfect,” says Turner about Callet’s perfectionistic streak. 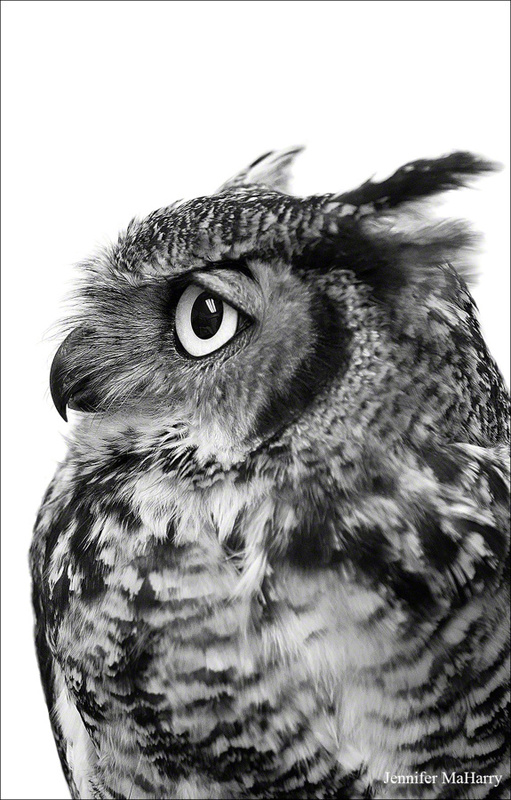 These remote animal portraits are difficult to come by. Remember, it took National Geographic photographer Steve Winter a year and a half to get that now famous shot of Griffith’s Parks P-22 with the Hollywood Sign in the background. 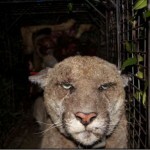 Indeed, Turner has been camera trapping for a long time. 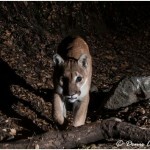 On her popular CougarMagic blog, Turner shares images taken with her remote cameras that she’s set up all around SoCal wild areas. These days, she’s posting more frequently on CougarMagic’s Facebook page. 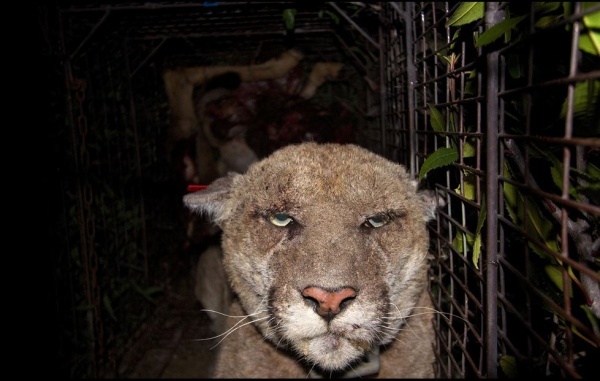 Years ago, she posted images of a collar mountain lion – P-12 – in the Santa Monica Mountains that caught the attention of National Park Service ranger Jeff Sikich. That photo revealed a broken radio collar which helped Sikch understand why he was having trouble tracking the big cat. After a 45 minute hike from the parked car, the pair finally reaches the first cameras that are secured tightly in Pelican boxes and fastened with strong ties. “Well…yes, that’s true…” reluctantly admits Callet with a sheepish grin. Near the end of the SD card, the duo strikes gold. “Yes!” exclaims Turner, fist in the air and emotion leaking from her eye. 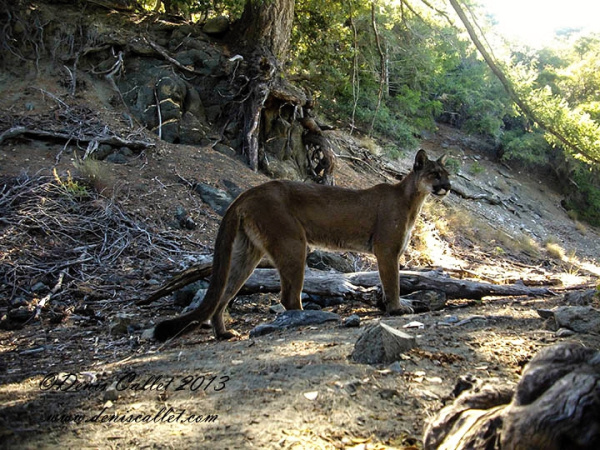 It’s King Arthur, a big mountain lion that Turner has camera captured in the area over the past three years. She carefully observes the cat’s walk, how he stops to smell the scent (Obsession by Calvin Klein) and then wanders out of view. It’s like seeing an old friend, she explains. Jackpot, three times over. After replacing batteries, repositioning lights and triggers, the duo checks the other cameras. Once again, squirrels and foxes are racking up valuable photo space (“It’s like the show should be called, ‘Fox and Friends,’” jokes Callet), but an image of two foxes playing in the snow is noteworthy. 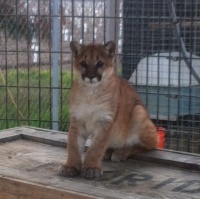 All in all, it’s been a good morning camera trapping for Callet and Turner. Over the years, they’ve spent thousands of dollars, countless hours hiking back and forth from remote locations, often coming back only with bad batteries, empty shots and unusable images. But the times that skill, expertise and luck all clicks together to produce Olympic gold images make up for any frustration or disappointment. Hands down. Below are just some of the images that Callet (along with Turner’s help) have produced. 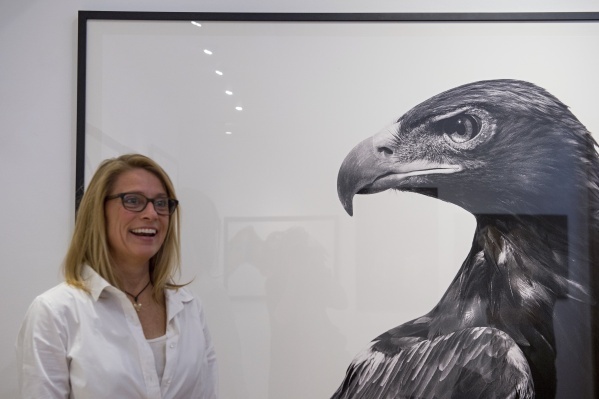 We advocate that any sane photographic gallery sign them up for an exhibition…stat!! The rain was fierce, pouring down in steady sheets on this cold morning in Ventura. What kind of day is this to count butterflies, I wondered as I pulled into a small neighborhood park to meet Donna Grubisic, a volunteer with the Vista-based Monarch Program. Fat drops fell on our heads as we shook hands underneath our umbrellas and walked passed playground equipment to a fence overlooking a grove of eucalyptus trees. “Do you see ‘em?” she asked pointing to a low hanging branch. OOOOHhhh…that low hanging branch was not covered with leaves…but rather was filled with butterflies, monarchs with dull under-sided folded wings. Huddled together motionless, the clump of monarchs were finding strength, protection and warmth in numbers. An average monarch weighs about 500 milligrams and large raindrops have a mass of 70 milligrams or more. Michael Raupp, professor of entomology at the University of Maryland compares raindrops splashing on monarchs to humans “being pelted by water balloons with twice the mass of bowling balls.” Ouch. 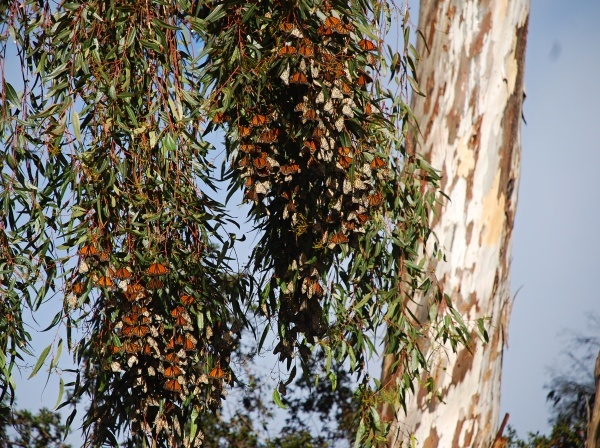 The count starts in late November since that’s traditionally when most monarchs in the West convene along Pacific coastlines in individual trees or in huge groves. 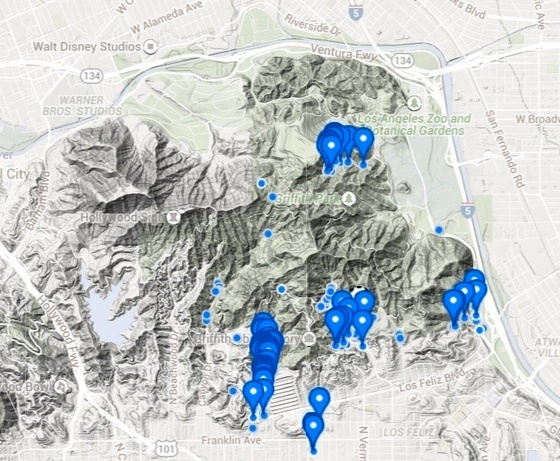 There are about 200 sites in California but only 100 are counted (not enough volunteers. Contact the Western Monarch Thanksgiving Countto learn how you can help). 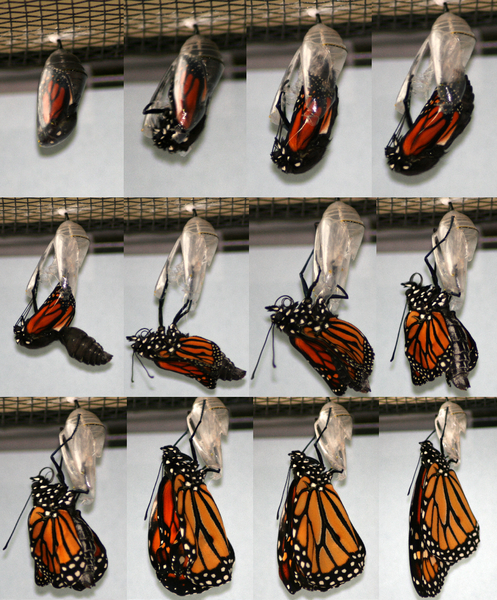 Monarchs typically hang out in our turf until early spring when they mate, lay eggs and then…die. 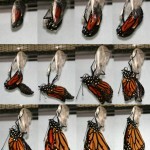 Only 3 percent of the monarchs eggs will make it to butterfly-hood and they will carry on the age-old migration pattern. 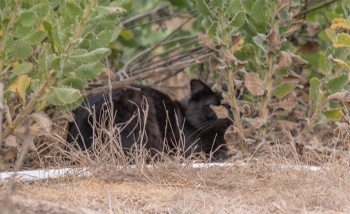 Grubisic counts at locations in Ventura, Carpentaria and Summerland and her numbers will be added to the ongoing tally sponsored by the Xerces Society in Oregon. (The official numbers from this count will be released in early spring.) She’ll not only count, but make notes about roosting trees, eroding habitats, any new development in the area and other new butterfly behavior. 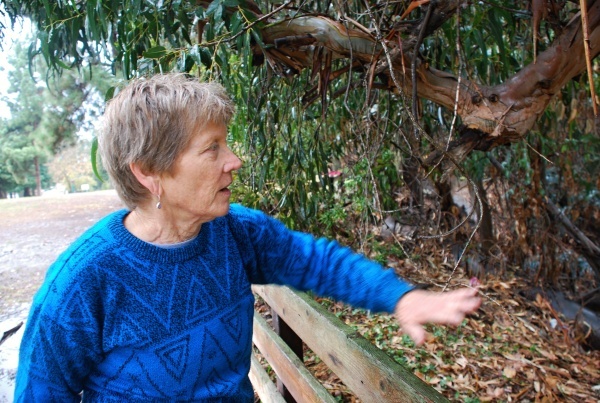 In addition to counting butterflies, Grubisic is a docent at Ellwood Butterfly Grove in Goleta, where, among the sprawling eucalyptus trees, she welcomes visitors, answers questions and learn about butterflies in the ecosystem. So far, the count at Ellwood has been down, she says. “It was 17,000 last year and as of about [mid-November] only 2,000” she explains. Monarch Program intern Charis van der Heide at Ellwood concurs in an email saying that “this year is shaping up to be very intriguing.” While the monarch numbers are indeed low for Ellwood (last year there was a peak of 40,000 in December), up further north folks are seeing record numbers at Pismo Beach Monarch Grove. More than 34,000 were counted very early in the season. “The butterflies seem to be shaking things up this year,” van der Heide concludes. “It will be really interesting to see what the numbers look like throughout California.” Climate change theories anyone? Overall, should California count its blessings when it comes to the western monarchs? A recent article by Jim Robbins in The New York Times “The Year the Monarch Didn’t Appear” describes the incredibly low numbers of monarchs that made it to Michoacan, Mexico this year. As of mid-November, only 3 million had arrived at their wintering home – last year it was 60 million and even that was a pretty low historical number. Grubisic notes that her counting areas have either yielded more, less or the same numbers of flutters. “Maybe they are roosting in other areas we just don’t know about,” she offers as we tour another one of her locations. 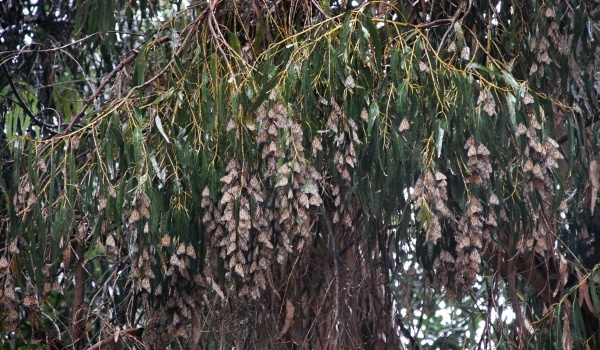 The rain is letting up and it’s easier to see the hanging clumps of butterflies high above. They look so vulnerable, clinging to one another, braving the wet and cold, waiting for the sun and spring flowers. Every year, more of their habitat is destroyed along with their beloved milkweed, the only plant they will lay their eggs on. According to the Loose Leaf blog of the American Forest Association, “the world’s monarch butterflies now fit into an area smaller than four football fields.” It’s the smallest space in 20 years. With a background in ornamental horticulture, Grubisic became interested in butterflies when her kids were little. As a family, they raised caterpillars, watching the transformation and later tagging the flappers to see how far they would travel. Slowly, Grubisic added nectar flowers into her garden which today, she says, is overflowing with ceanothus, lantana, star dusters and of course, dozens of varieties of milkweed. 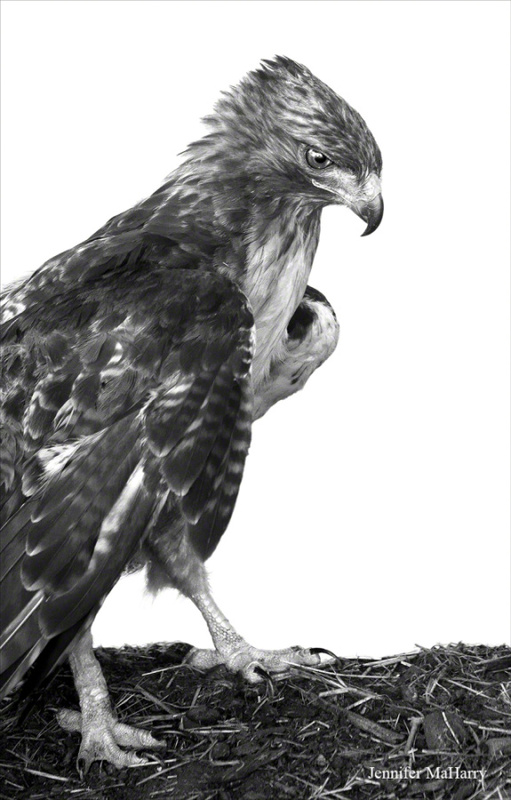 Captured with serious, bold and unflinching poses, the new exhibit “Nature LA: Birds of Prey” running into Jan. 5, 2014 at the G2 Gallery in Venice showcases Southland feathered flappers from the lens of Culver City-based photographer Jennifer MaHarry. These are the not the happy chirpers helping Cinderella that you’d see in a typical Disney movie; no these are raptors, serious and unflinching, thoughtful and daunting, birds that make you instantly realize how close genetically they are to their dinosaur ancestors. MaHarry is best known for her poignant and intimate images of wild horses; she’s a long-time advocate against the government sanctioned roundups of wild mustangs and burros, events which, she says, allows for many organizations to buy these magnificent creatures and profit from their slaughter. 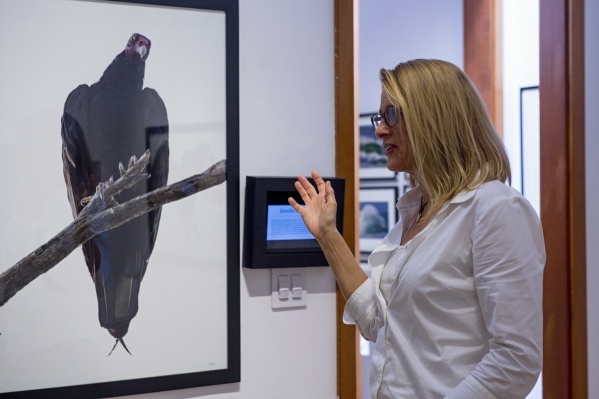 MaHarry’s current exhibition, however, features the beauty and power of local birds of prey; and it all came together by missed opportunities, an afternoon of 100+ temperatures, and perched turkey vultures eyeing her in the Arizona wilderness. Earlier in the year, MaHarry had made arrangements to photograph a wild horse and burro roundup in Nevada; but unlike other times where she was allowed in to snap and capture images, BLM officials there denied all photographers from the event. “Everyone was hopping mad,” she recalls wondering how she could salvage this trip with some images. (MaHarry’s day job is a graphic designer working in the motion picture marketing arena.) She knew of a natural horse habitat in Arizona and thought, ‘Maybe I can find some,’” and booked a quick flight there. MaHarry took that fascination to a broader scope and decided that if she couldn’t photograph horses, maybe another critter was calling to her camera. 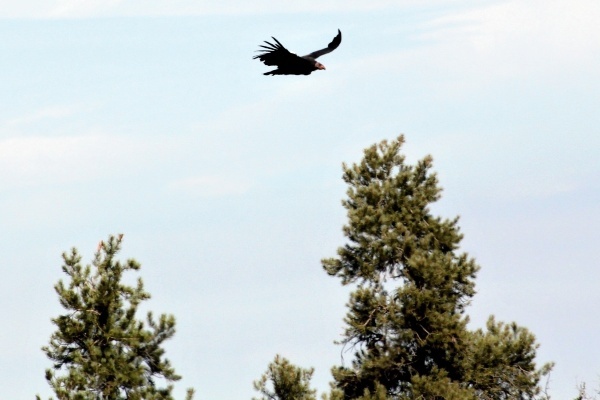 She contacted officials at local wildlife rescues – theOjai Raptor Center and the California Wildlife Center – to see if she could photograph any birds of prey there. 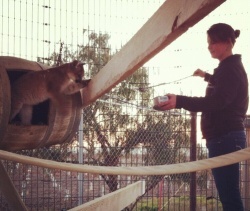 For months, she visited the centers to snap rehabilitated birds, many that would soon be released back to the wild. 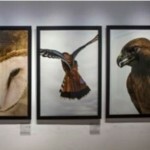 Among the portraits of local raptors – red tailed hawk, merlin, barn owl, short eared owl and more – at the exhibit, MaHarry’s image of the Arizona turkey vulture hangs as a testimony to her photographic journey. 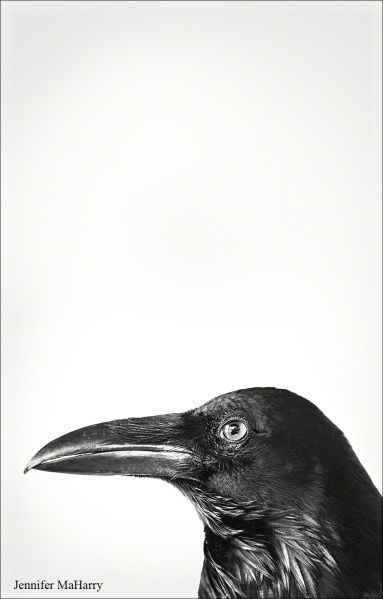 Also, a raven is present, and while not necessarily a bird of prey, a bird that MaHarry wanted to include because of its intense intelligence. 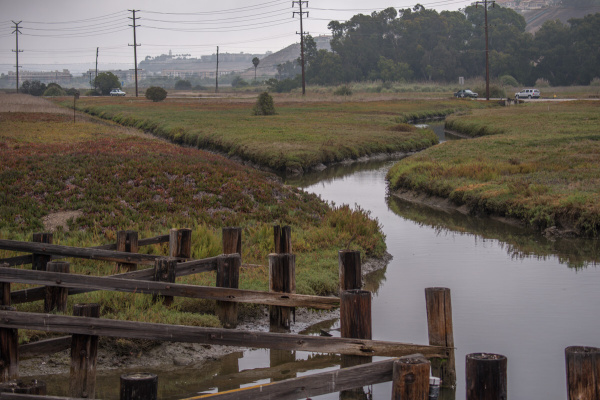 Today, the Ballona landscape is set to change once more. 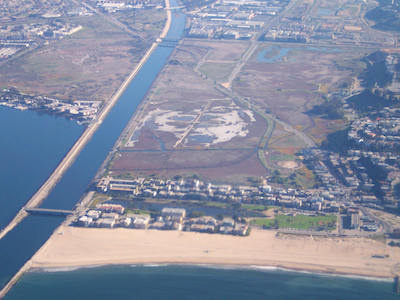 The reserve has been owned by the State of California since 2003; the area is managed by Fish and Game with the California Coastal Conservancy and the California State Lands Commission part of the equation; the volunteer-basedFriends of Ballona Wetlands also has a stake in the upcoming discussion about tidal flushing. 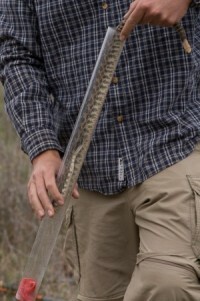 It’s not every day you get to watch two grown men wrestle a young Southern Pacific rattlesnake from its hiding place underneath a pile of sticks into a Plexiglas tube. 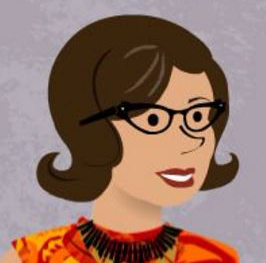 All in the name of education – and with a certain amount of scientific machismo – Drs. Robert Espinoza and Greg Pauly held up the anxious and finally squeezed-in reptile to the gaggle of folks who had joined these two for a Lizard Walk in Malibu Creek State Park. “Stand back and get in line,” they directed as youngsters and oldsters obeyed. 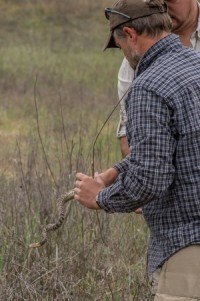 After all, who wouldn’t want to touch the rattle end of a wild, just-caught rattlesnake? 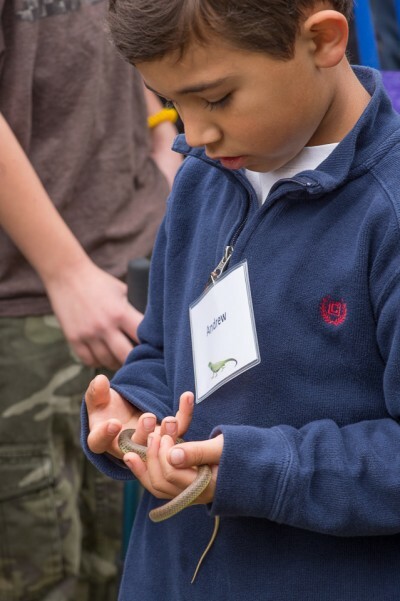 This was no ordinary traveling reptile show that you’d find visiting libraries or first grade classes. No, this was a nature in nature experience. 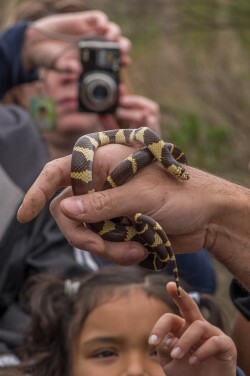 A program from the Natural History Museum, this family-friendly trek got kids squealing with delight as some adults shirked back, happy to let the little ones go first, get close and touch whatever critter was discovered. And a LOT was discovered on this half-mile trail. 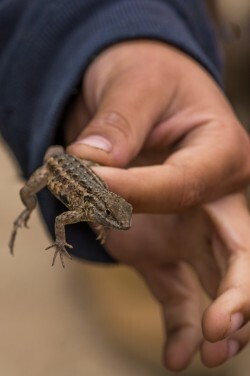 In fact, the regular hikers and outdoor folk who were enjoying the trails around the popular park probably didn’t realize the reptile potential that lurked underfoot and just a stone’s throw away from their….feet. If you’re not looking for wildlife, you probably would have missed it slither, zip and zoom away. 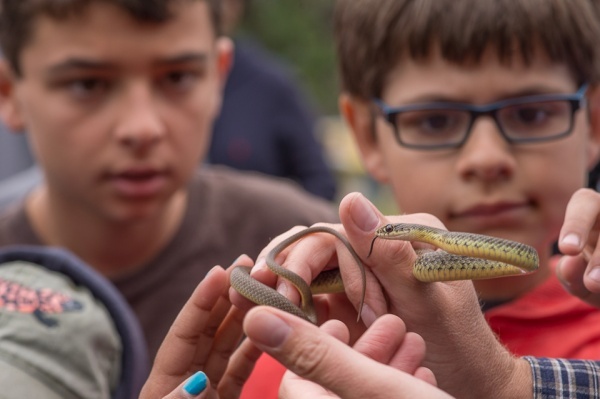 The outdoor excursion started off on a high note: young Andrew procured a Western yellow-bellied racer snake, a reptile not often seen in the area. (“Wow, I don’t remember the last time we found one here,” said Espinoza.) In fact, fearless Andrew was the star of the morning also catching more than his share of beasties. 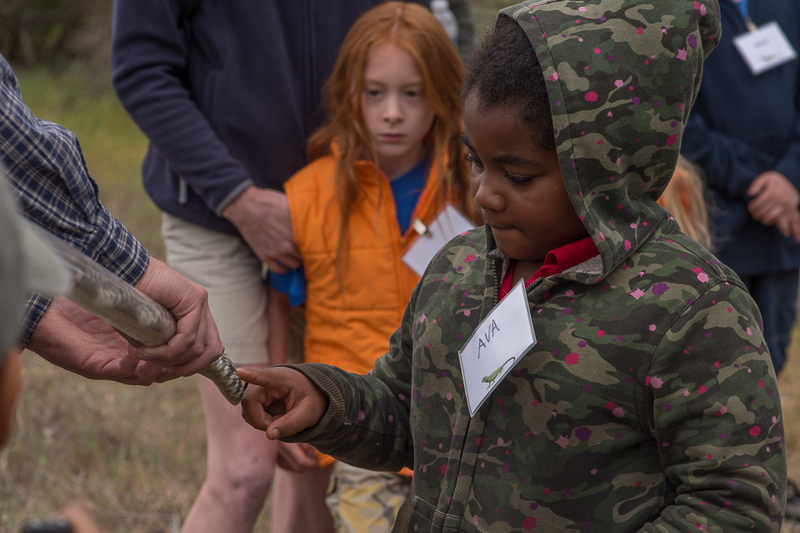 Other young snake wranglers-in-training were not as lucky as Andrew whose mother confessed that she probably will have to buy him a snake stick (long pole with a flipped end to catch slippery snakes) to encourage his uncanny reptile connection. 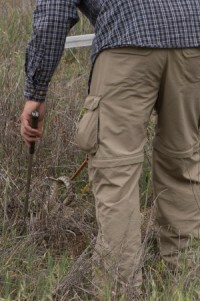 Since it was an overcast and cool morning, reptiles were not out basking – which meant more digging for lizard lookers. 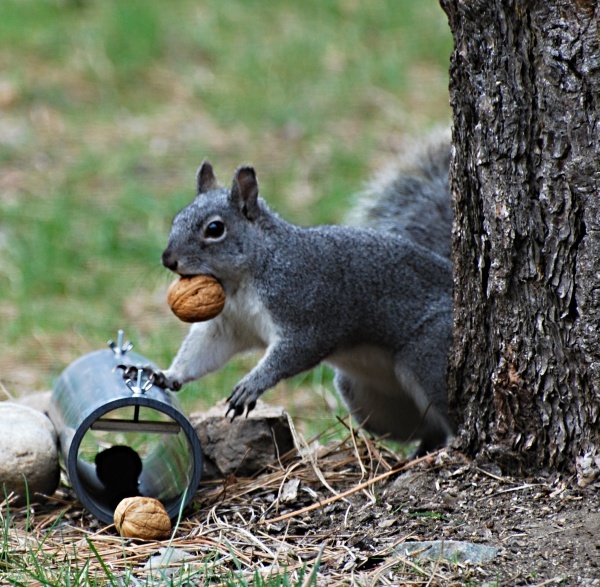 It seemed critters were found…well, everywhere. 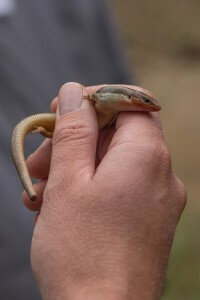 The only common SoCal lizard not found was an alligator lizard. Newts, said our lizard leaders, used to be plentiful in the area, but aren’t typically found anymore in the Santa Monica Mountains anymore. Introduced crayfish and bullfrogs found newt eggs a delicacy. The newts have moved on. As kids perfected the rock flipping (“Make sure you flip the rock in front of you; you don’t want some thing to run into your legs!” was the instruction that most kids forget in their zeal of discovery), parents were thrilled to have pro biologists validate their child’s fascination with reptiles (“You should see what his/her room looks like”). And just as the group was walking back to the parking lot, there as if on cue, the rattler was discovered. Espinoza and Pauly channeled their inner Steve Irwin as they carefully grappled the annoyed snake into the show tube with rattle end exposed. Sure the kids lined up first to touch the dry rattle (who learned it made up of hollow keratin segments), but the adults were there as well – even some adults not part of the group but who witnessed the earlier wrestling match and just had to see the temporarily restrained snake for themselves. 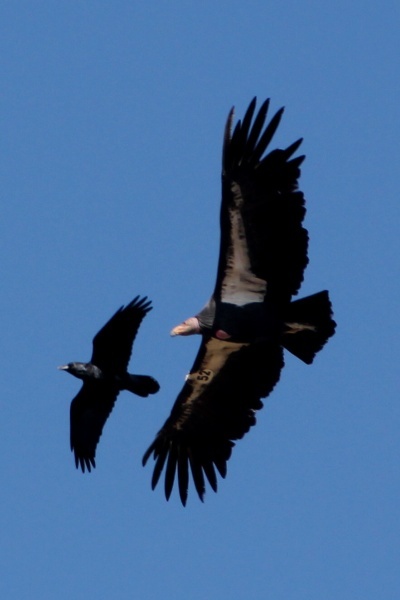 About four months after the Army Corps of Engineers ripped apart 48 acres of the Sepulveda BasinWildlife Area in the San Fernando Valley, wildlife continues to surprise and amaze – even though the absence of so many birds, mammals, reptiles and amphibians still serves as a reminder that nothing in this life is ever a sure thing. From the moment we set foot in the North Reserve, we see birds flittering, fluttering and flapping everywhere. 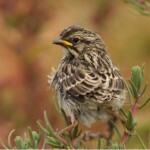 White crowned sparrows on the ground, yellow-rumped warblers belting out tunes on a sycamore. 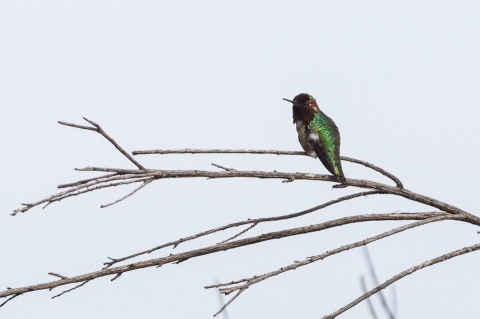 Is that an Allen’s or a rufous hummingbird on that branch? My fellow birders thumb through well-used books to answer each other. 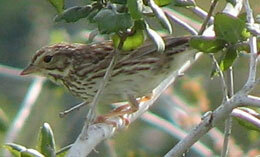 Half of the fun of birding, it seems, is discovering what bird it was that you actually saw or heard. 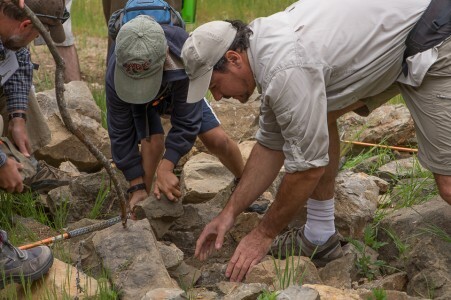 We wander through the riparian and woodland areas of this natural place that was designated in the 1970s and then later developed in the 1980s with help from Audubon and the Native Plant Society. Towering hedges of wild roses flank our pathway that runs parallel to Haskell Creek, an original tributary of the Los Angeles River. A large “Mr. 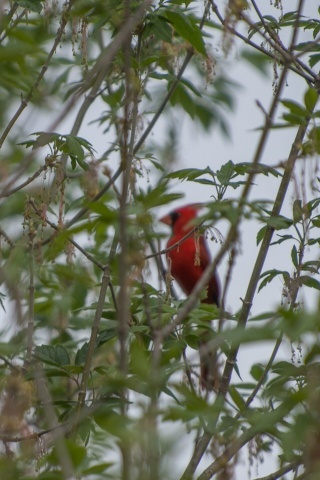 Big” birder announces, “Hey, aren’t we near where the mythical cardinal lives?” Ohlenkamp agrees but adds that it hasn’t been seen in a while, and usually folks spy that red-feathered wonder earlier in the day. In other words, don’t get your hopes up, fella. We wander to a pond and an island where large birds preen and perch on tall trees. Red-winged blackbirds, grackles, green herons and other shorebirds cavort in the tall grasses, cattails and reeds at the pond’s edge. The cacophony of tweets, chirps, songs and trills often drowns out the sounds of the nearby freeway. IT’S LOUD. What? LOUD. Ohlenkamp gets an osprey in his scope followed by a kestrel. Both seem to strike a pose for us as we peer at them. “Well, we are in Los Angeles after all,” someone jokes. Our wanderings in the North Reserve end at a darken tunnel which leads us to the South Reserve – the scene of the crime, as it were. Ohlenkamp prepares us for what we will see once we step out into the light. The landscape change is dramatic. The near claustrophobic thickness of plant life in the north yields to an agoraphobic expansiveness of 48 acres of tree stumps, dirt mounds and wood piles. 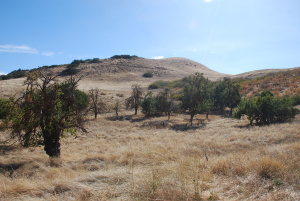 Only tall native oaks and cottonwood remain along with a stand of non-native eucalyptus. I could tell the wound is still fresh for Ohlenkamp and many local birders. It’s hard to look at the space after just experiencing a rich, noisy, lush land, only steps away. Yes, a lack of noise. It was oddly quiet here…probably because so many birds are gone, having lost their nesting, hiding, perching and food sources. Residents and migrants will not be nesting here this year, Ohlenkamp tells us. And probably for several years to come. 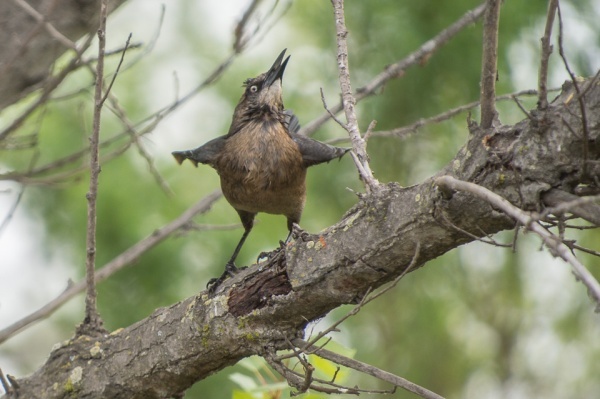 “California thrashers were an abundant all-year resident of the South Reserve and they have been extirpated, just prior to their breeding season,” he says. They have not been seen here since January. 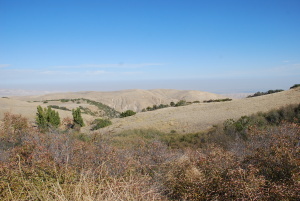 The South Reserve was also nesting home to the endangered least Bell’s vireo that has gone incognito as well. 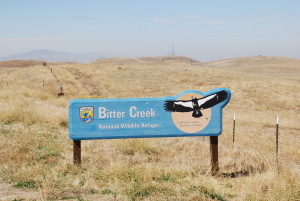 It’s hard to say specifically what else besides birds were displaced when numerous native willows, mule fat, coyote brush and elderberry trees were destroyed. No official records were kept as to a wildlife list, although an appendix to an Army Corp document lists 35 birds as common (experts say more than 200 birds species have been seen here) and only four mammals – coyote, squirrel, skunk and raccoon – but they didn’t count rabbits which we saw on our walk. No mention of reptiles, amphibians or even insects that for sure were here at one time. Ohlenkamp points to an area for a proposed pond, lake and winter seasonal marsh, all part of the original 1981 Master Plan for the South Reserve. The 7-acre lake was previously dug but never filled with water. 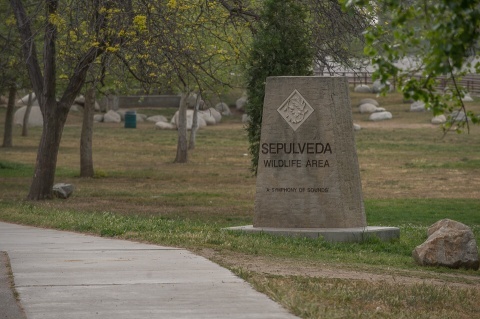 In fact, it’s that original Master Plan that Audubon, along with other community groups (Sierra Club, California Native Plant Society, Sepulveda Basin Wildlife Areas Steering Committee and Encino Neighborhood Council) wants to see reinstated and used as the template to restore this section. A meeting of those groups with the Army Corps is slated for April 23, 2013 and Ohlenkamp says he’s pretty confident that the Corps will adopt that original Master Plan. “Even so, it probably will be five years before this space is back to what it was just months ago,” he says. Along the path to the confluence of Haskell Creek to the LA River, birders discuss the ramifications. Some think of the good that will come from this. One woman says that this tragic episode brought together community groups that normally wouldn’t know each other. That Master Plan is now high priority whereas it wasn’t just months ago. Part of the proposed new plan would also target three species of birds (greater yellowlegs, white-faced ibis and blue-winged teal) to act as “indicator species” – canaries in the coal mine, as it were – to physically represent how the South Reserve is ecologically faring. 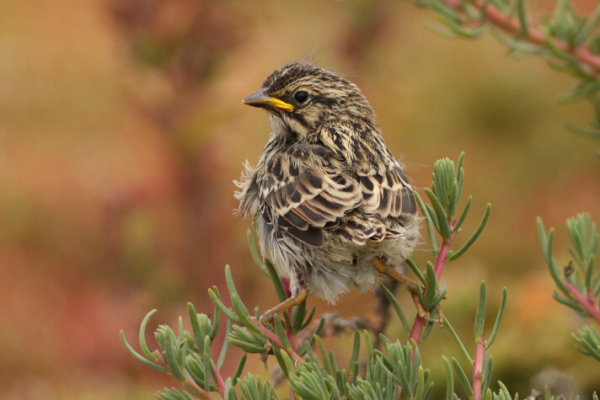 These three birds have all been seen in the basin – as recent as this month – but not in the South Reserve. It will be a celebratory day when those flappers decide to “set up shop” and start to reclaim the area. 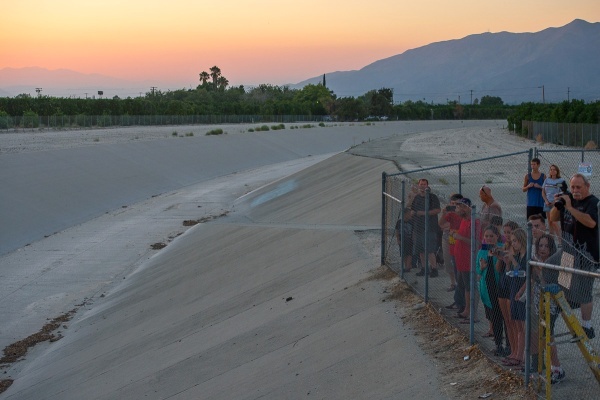 We head down to the merging waterways with the Sepulveda Dam framing our horizon. 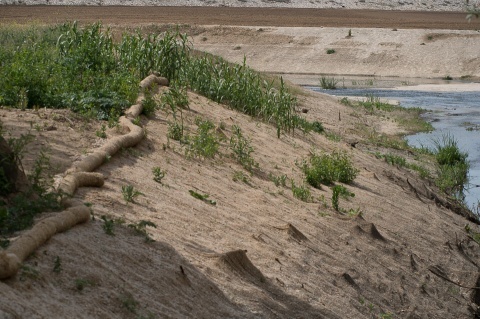 We watch sandpipers, killdeers and black neck stilts poking through the riverbeds. A group of coots confer with each other in the middle of the river. Three stilts rise up and zoom with break-neck precision over the water. Well, time is the great healer, but more than likely, time won’t erase every trace of misunderstanding and miscommunication that resulted in this man-made destruction and death of so much plant and wildlife…and maybe it shouldn’t. Channelle Davis was trying her best, but I was getting nervous. The wildlife biologist with the Department of Fish and Wildlife was giving us newbies a crash course in how to identify big horn sheep, particularly the delicate differences between the young males and the females. Along with about a hundred or so fellow volunteers, I was getting an overview of a herd of big horned sheep that call the San Gabriel Mountains their home. 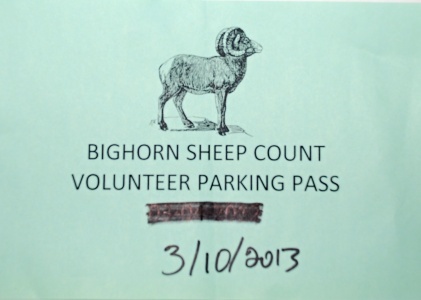 This workshop would prepare us for the annual Big Horn Sheep Survey that has been taking place since the 1980s. 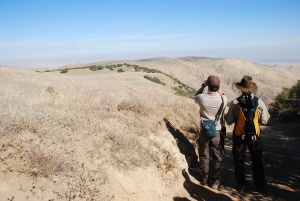 Citizen volunteers trained in spotting and categorizing the hoofed mammal, help biologists learn more about the herd that has a mountain top view of Azusa, Rancho Cucamonga, Duarte and other eastern San Gabriel suburbs. Often helicopter counts are held in conjunction with ground counts – but not this year. The reason for the decline and upswing? Old growth and fire, we were told. In the late 80s, the hills and mountain tops were getting too thick with vegetation, making it hard for the big horns to move around, let alone reproduce and care for young. With the fire of 2003, the area was cleared out, new growth came and with that, higher numbers of sheep. As strange as it seems, fires can be great for wildlife. 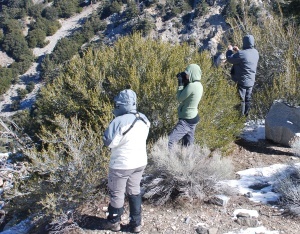 We sheep spotters also learned that we may see collared sheep, big horns that are part of an on-going research project. More than 60 were collared in 2006 – about 14 still have radio-activated collars. Before the workshop concluded, we signed up for our research group locations. Did I want to scramble over boulders, hike through streams or blaze through thickets? Naw, I wimped out and opted for the relatively “easy” location off Highway 39 near Crystal Lake. 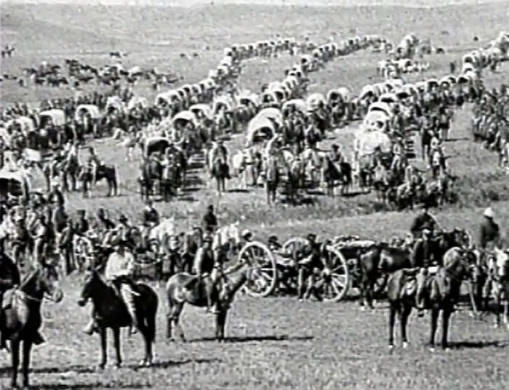 Six viewing sites were available on a three-mile paved road, not used anymore by the public. Yeah, I wasn’t ready to do the Hard-Core Get-Up-At-Crack-Of-Dawn-Loaded-Down-With-Gear-And-Hike-For-Hours route. Not this year, anyway. 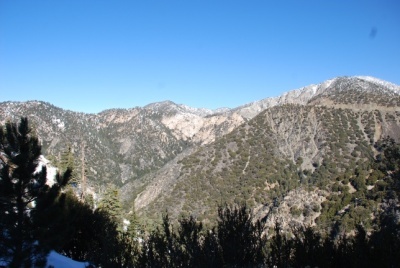 Next morning, driving up to the location, I saw snow in the distant mountain tops. Little did I realize that the temperature conundrum I was about to enter. 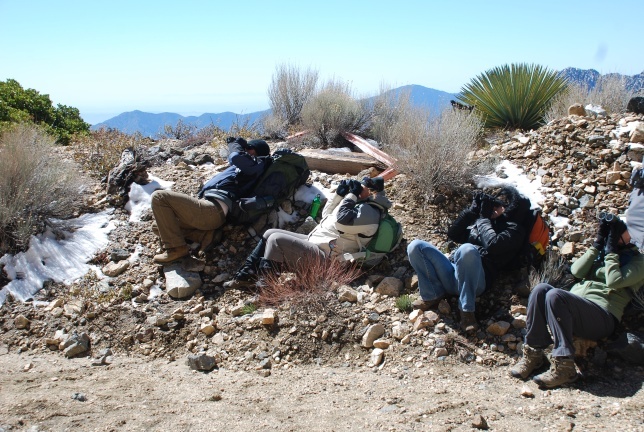 Sure it’s 80 degrees down in the basin…but up near 5,500 feet, life is completely different. Arriving at our rendezvous point, big chunks of snow lined the side of the road. A fierce Santa Ana wind was blowing, swirling snow crystals up and around. The higher we walked up the road, the stronger the wind blew nearly knocking us off our feet. Still, trained sheep spotters were here and we had to try. I opted to join Group Number Three about two miles up the road, a spot where historically sheep have been recorded. I stomped through snow piles in my tennis shoes to find a rocky overlook where I placed my foamy garden kneeling mat and was set for spotting action. The wind was torrential, but I was up for the challenge. Binoculars in hand, I scanned the hills, the bushes, the brush, the erosion lines of the surrounding landscape. I looked for white rumps, long legs or anything that moved. Alas, in the hour I sat there, I only witnessed a car moving up on Highway 2. I kept imagining the moment when I would see a small group emerge from underneath a grove of Coulter pines. I envisioned me grandiosely recording the number, accurately categorizing the males with no hesitation and then, and then, even spying a lamb. I thought if I imagined it hard enough, I could will it to happen. No such luck. After more than an hour, I attempted to eat my lunch, but because of the bitter wind, I didn’t want to take off my gloves. I regrouped with my fellow sheep-less peepers and we finally decided to head back down. 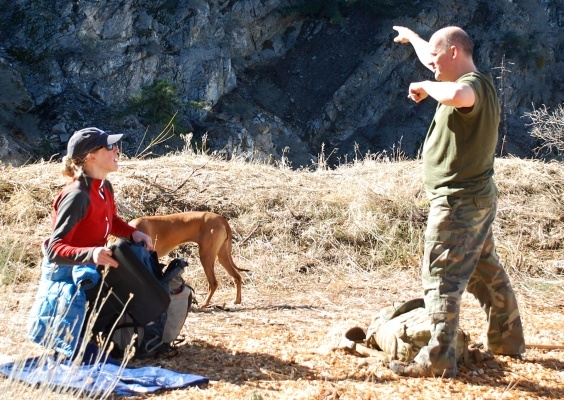 Group Two was packing up their site, when one volunteer thought she’d scan the nearby hill one more time. As we approached, we heard her joy in discovering a small herd. My camera and binoculars were around my neck and, Halleluiah, I spotted them, too. Far off in the distance, they effortlessly moved over a thick rock slab and wandered between trees. Three rams, I saw, but more were out there. “I counted eight,” said someone. “I counted 10,” said another. “I just saw wild sheep!” I told myself. I was overjoyed on the ride back down and the rest of the day. Later, I heard from Chanelle Davis that her group saw sheep right near their rendezvous location. Sheep were everywhere at her location…and no blowing snow‼! “We just looked up and there they were!” she said. “Don’t rub it in,” I told her. Of course, she had to gloat and sent me photos from her excursion. Show-off. Still, as Chanelle and I talked, I realized that even though I didn’t hit a mother lode of sheep my first time out, the experience reinforced the notion that wildlife is everywhere around us in Southern California. Maybe as I was sitting there in the freezing wind, a sheep was observing me from a high perk. We humans just need to sit still more and observe. That said, yeah, I probably will sign up for the survey next year. I mean, come on. Nature can’t certainly have the last laugh, can she? 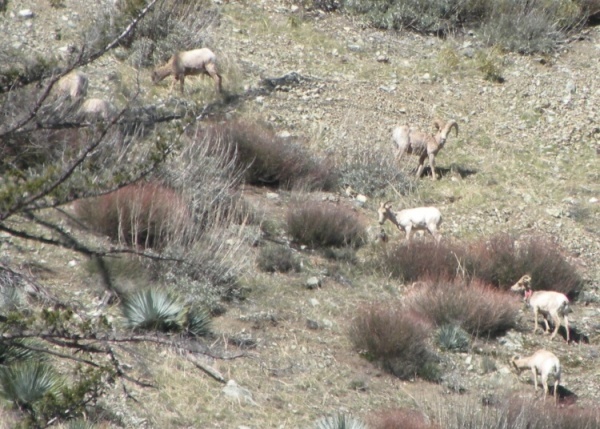 To register for the next big horn sheep survey, visit here. They have loose, rolling skin and their ribs show through their tiny brown bodies. There is a glaze in their large round eyes. When they flop or lay down on the cement dry areas, it’s not the normal lounging that healthy California sea lions typically do for hours on end. Even their whiskers seem droopy. These pups are sick. The staff, including an extensive volunteer organization, has been working overtime to care for and fatten up these normally active pinnipeds so they can return to the ocean. 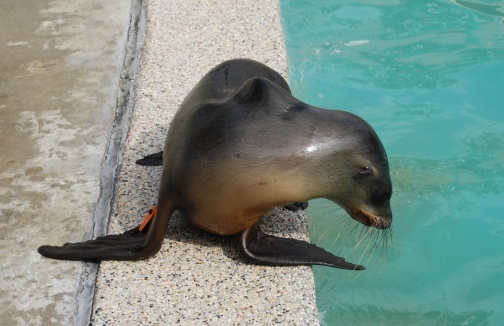 But the center’s enclosures are getting full and every day it seems, another thin and confused sea lion is brought in. Indeed, officials gave the go-ahead to start an extensive revamping of the center’s drainage system last month considering January is “downtime.” That’s all been put on hold since staff and volunteers are working round the clock to assess, treat and care for the skinny pups. 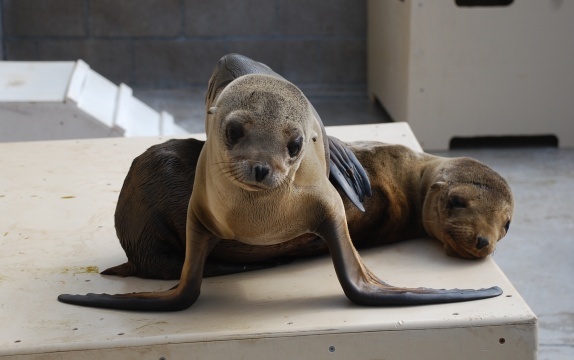 There are many theories as to what is causing so many malnourished young sea lions, but overall, scientists are stumped. 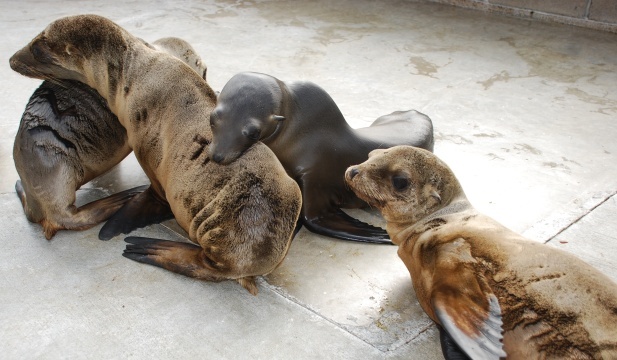 “We currently do not know the reasons for the poor condition of California sea lion pups,” says Sharon Melin, research biologist for NOAA currently based in Seattle, WA. Melin and fellow scientists are currently sampling dead and live pups to see if there are anything unusual that would explain low weights and the poor condition of the pups. Another factor maybe the warmer-than-normal sea surface temperature that took place in Southern California in the fall of 2012. 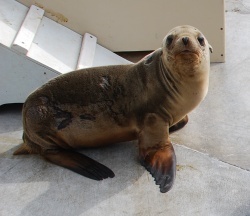 Warm temps could have relocated sea lion prey so mama sea lions were struggling to find food and produce milk. “At this time of year (February), most pups are not weaned completely and are still largely dependent on their mothers for nutrition,” she says. 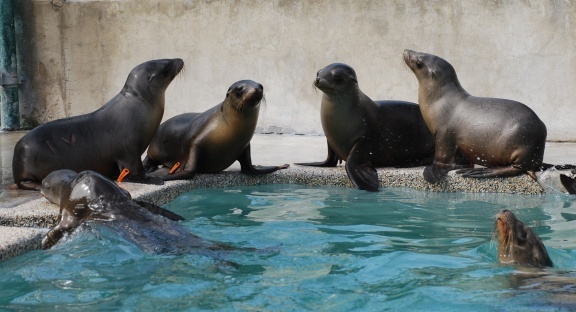 Back at the noisy and bustling care center, healthier pups (ones who have been at the center the longest) are frolicking in a pool, barking and snapping at one another in true sea lion form. Others are draped protectively over their buddies as they sprawl on the sidelines. This wildly active scene is a sharp contrast to the nearby weak pups that still look, for lack of a better word, shell-shocked. 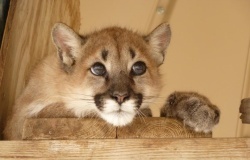 As a non-profit, the Marine Mammal Care Center relies on public donations for financial support. They also have a wish list of items that can be dropped off for use at the facility. 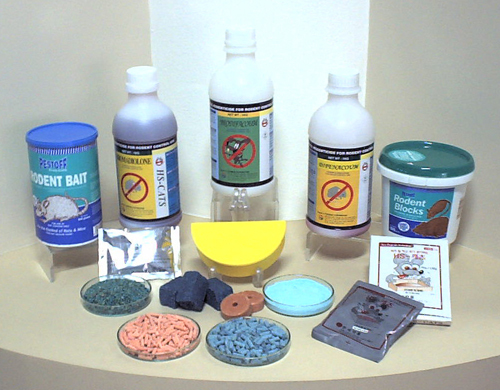 Household bleach, safflower oil with vitamin E, bottled water and other items listed here are greatly appreciated. The center is also opened for tours and school visits. Call to schedule a tour or to get more information. Only in the asphalt jungles of downtown Los Angeles can one witness the powerful and mouth-dropping mysteries of nature from atop a simple parking structure. And we’re not talking the leery-peeping-Tom, things-you-don’t-want-your-grandma-or kids-to-even-KNOW-about brand of wildlife. No, we’re talking authentic feathers, beaks, talons and razor sharp bird brains. Real-time 3-D wildlife. 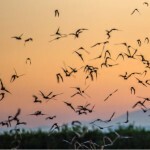 The flight of the petite but speedy Vaux’s swifts from Southern Alaska to their Central America winter home is just as astonishing as the great migration of the wildebeests across the Serengeti-Mara plains – perhaps not as thunderous and with, thankfully for the observer, no chance of being trampled underfoot. Jeff Chapman, director of the Audubon Center at Debs Parks, has been tracking the movement of the birds with his fellow Auddy buddies up and down the coast. Determining when the birds will hit Los Angeles is an unknown science, but he generally expects the birds to reach their peak from the mid to late September on their southbound migration. This year is no exception with the small, cigar-shaped birds with crescent wings currently filling the sky at dusk amid a backdrop of skyscrapers, roaring helicopters and spewing busses. Indeed, the spectacle gives pause to any causal non-bird watcher who unsuspectingly notices the kinetic cloud overhead. “Are those bats?” asks one parking lot patron who sees Chapman and a small group of birders sitting on folding chairs with heads cocked skyward and binoculars in hand. Chapman gives him the low-down. 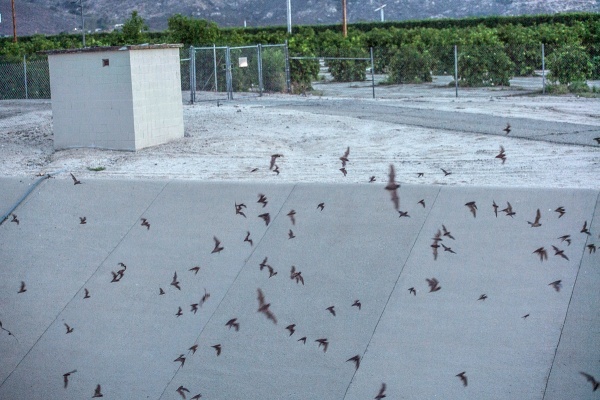 Twice a year, Vaux’s swifts pass through Los Angeles, but it’s only been two years ago they have been found using this spot for overnight housing. Chapman heard that folks used to see them use the abandoned old Nabisco Bakery near the Loft District, but that was years ago. When not plunging into the chimney for the night where they will cling to the walls and keep each other warm, the swifts are extremely active eaters during the daylight. Vauxies have voracious appetite for small flying insects, beetles and bugs, as they gorge themselves to keep up their strength for their travels. 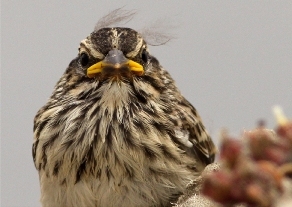 For anyone who’s swatted a fly or cursed a mosquito, these birds are your pals. 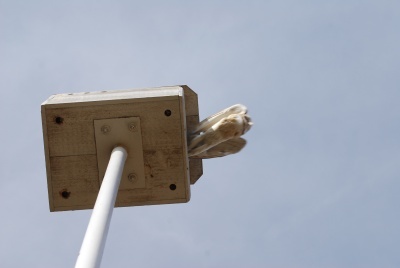 It’s nice to know that the swiftly-flying swifts are not technically endangered, but there is concern that many of their favorite man-made roosting centers are disappearing. With many old masonry chimneys being torn down, the birds are without adequate cover for the night and safe from predators, like the ravens that perch on the chimney top, picking off a swiftie evening snack. The birdwatchers on the parking lot roof see the ravens nonchalantly capture swifts and fly away with their prey for solitary dining. “This is probably why swifts lay many eggs, because it helps their numbers when they migrate,” explains Chapman. Still, it’s not hard to feel sorry for the few Vauxies that are snatched away; it’s easy to raise a shaking fist at the opportunistic ravens. 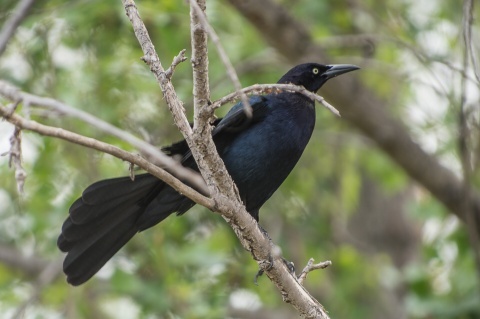 After all, those black birds haven’t flown hundreds of miles in a single day – they just laze around trash cans or scoop up fallen food here on downtown’s Broadway Avenue. What do they know about sacrifice and endurance? As the sun finally disappears and blackness settles in, the birds pick up the pace as they enter their nightly lodging. Suddenly, they swirl in unison, a giant whirlpool of feathers flapping, accompanied by small tweets and then, swoop! Down the chimney they zoom and in a flash, the sky is suddenly empty of swifts. We agree. We also think that the swifts need a better creative marketing manager. After all, their cousin the swallow has songs, traditions and parades built up around their annual migration. Musicians, now is your time. 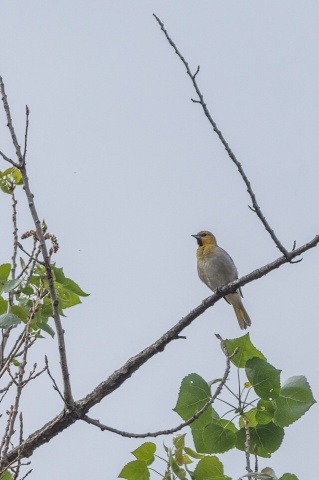 We challenge you to write that inspiring song that will tell this bird’s story. Get cracking. They are only here for a few more weeks. 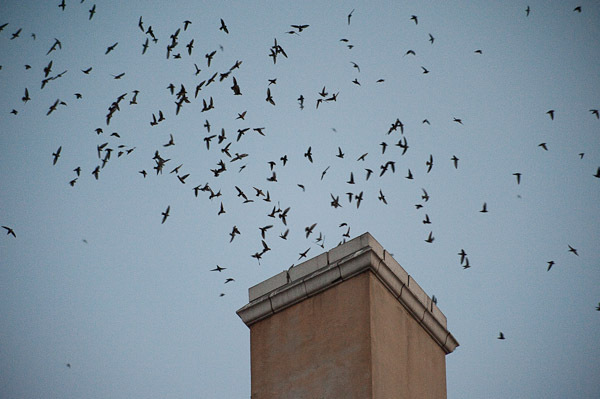 The Audubon Center at Debs Parks will hold two organized public viewings of the Vaux’s swifts from 6 to 7:30 on Friday Sept. 23 and Sept. 30 atop Joe’s Auto Park at 440 Broadway in Downtown Los Angeles. Parking is $3. Birdwatchers are encouraged to bring picnics, binoculars and something to sit on, plus head covering. Park on level just below the top, because if you park your car on top, it will get “painted” by bird poo. We’re not kidding. I had the most wonderful opportunity to board a whale watching vessel one morning out of Long Beach with staff and biologists from the Aquarium of the Pacific. We were on search for those lovely leviathans of the deep, our summer visitors, the blue whales. Along with photographer friend, Martha Benedict, we captured what it was like to be on a watery expedition. 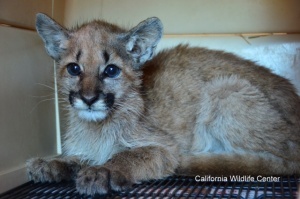 Here’s our featured post for SoCalWild. It’s the collective gasp from the crowd aboard any whale watching vessel when the observed whale decides it’s time to forgo the surface and dive deeper. Up its body arches and then, just before the hulking cetacean plunges downward, the fluke emerges from the water, dripping, waving, announcing its presence in a majestic display of form and beauty. Here in Southern California, whale watching is a 12 month event since certain times of the year brings certain whales to our waters. Summertime, however, has proven especially delicious for whale watchers because the blues have come closer. For the past seven years, the giant blue whales have altered their normal feeding areas and opted to move closer to the coastline, making it easier for whale watching boats to bring folks out to them. Why did they move closer? A yummier brand of their preferred prey, the shrimp-like krill, here? More predators out in those wilder waters? Scientists aren’t sure, but what they do know is that the summer of 2011 is setting up to be one of the most spectacular summers ever to observe the blue whale, The Largest Creature Ever To Live On The Face of Earth (cue: music sting). On a recent whale watching trip out of Long Beach, whale watchers were treated to a rare sight – a mother and an estimated 4 to 5-month old calf, resting, feeding and frolicking in the waters only 7 miles from shore. On deck were staffers from the nearby Aquarium of the Pacific who were patiently answering questions about the blues, but who were also on board as part of an ongoing scientific observation about the whales. Mother and baby. Notice the mom’s spine. She’s losing weight since she is nursing her baby with her super-rich, 35-50 percent milk fat. By contrast, human mom’s milk is a mere 2 percent. 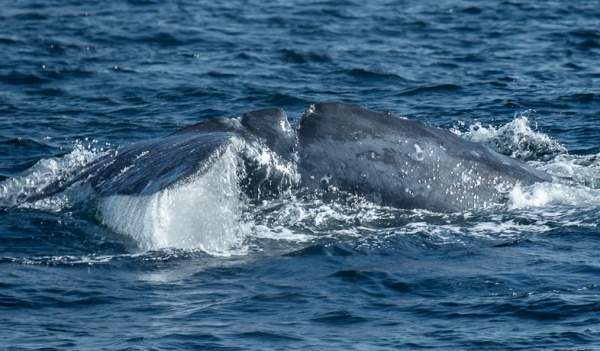 For three years the Aquarium has partnered with Cascadia Research Collective based in Olympia, Washington, providing biologists with data, photos and notes regarding the endangered blue whales that make Southern California their home for the summer months. “We’re out here on their daily whale watching trips, twice a day,” says Kera Mathes, the aquarium’s boat program coordinator who’s handy with a camera, has an eye for the whales and was instrumental in getting the partnership off the ground. 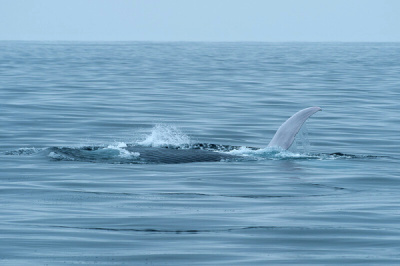 Mathes directed a nearby intern with a clipboard how to chart the data from this sighting – how long the pair were above water, what they were doing, estimates on size and if these whales have been previously recorded. Cascadia has a huge data bank of blue whales from up and down the coastline and what Mathes and company see out here will be added to that information. 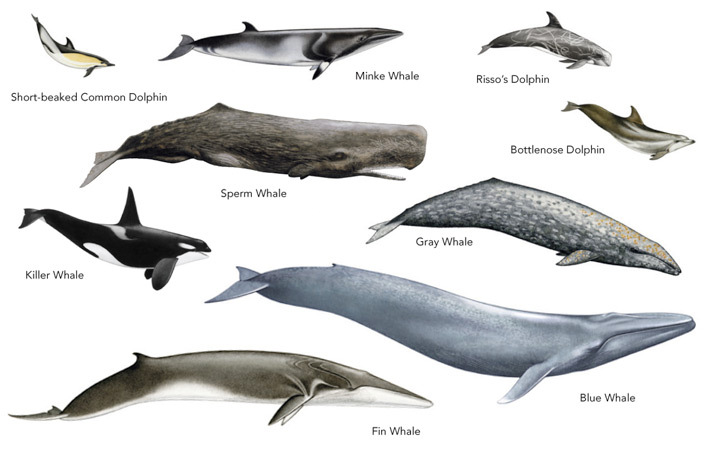 Currently, about 2-3,000 blue whales are thought to be in the Pacific waters, but relatively little is known about these mysterious swimmers, despite the fact that they are The Biggest Thing Ever On This Planet (cue: a higher musical sting). 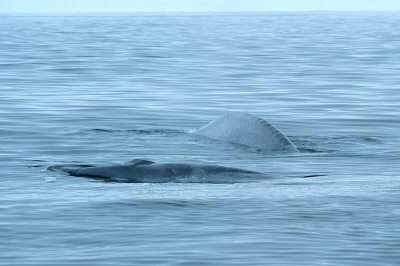 It’s not known exactly where they go in the wintertime and their migration paths are very much a blue whale secret. 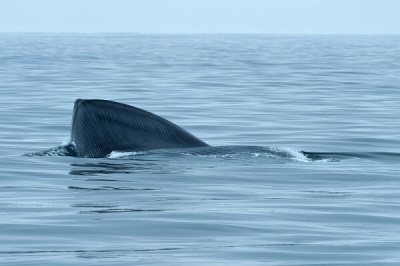 Back on the boat, after the cow and her calf was spotted, the captain turned the engines off allowing us humans could hear the blow of the blue whale, that powerful breathe of air that translates into a 30-foot plume of mist. Admire from a distance. Lots of bacteria in that spray. But today was a trifecta for whale watchers. Not only was a cow/calf pair spotted, but the baby dived, revealing its fluke, another very rare occurrence indeed which elicited big sighs and low cries from all on deck. …and rolling over with a flipper wave. 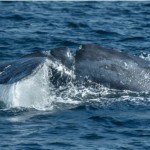 No blue whale/cargo boat accidents have occurred this year – so far. On the ride back to port, a pod of 100 common dolphins swam merrily alongside the vessel – another glorious sight. But then, once in the harbor, discarded plastic bags, soda bottles and streaks of oil on the waters’ surface disrupted those good images. (Oh, come on guys! Really??) But interruptions aside, the image of the tail, the baby tail, the lunge feeding and the two great creatures living in our waters is a great motivator for change. Because, really, If We Humans Are Not Going To Change Things Now, Then When? (Cue: indecisive music sting). 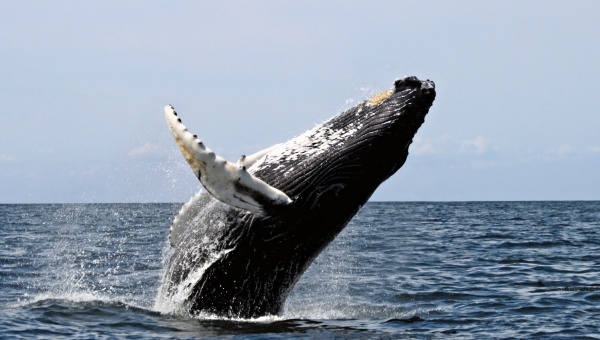 For more information about whale watching cruises offered daily by the Aquarium of the Pacific and Harbor Breeze Cruises click here. Trips depart daily at 11:30 a.m. and 3 p.m. Combo tickets, which include a whale cruise and aquarium admission, are available on site at the aquarium; admission is $63.95 for adults, $55.95 for seniors and $39.95 for children. When I stumbled upon David Marlos’ wonderful website, “What’s That Bug?”, I didn’t realize that Marlos’ was a neighbor. Only after I submitted a query about identifying a group of bees that every morning clung to a single lavender stalk, did I discover that Marlos lived practically right down the street from my Eagle Rock home. 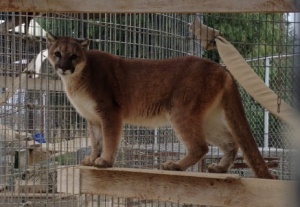 I was happy to profile him in a recent post on SoCalWild. Alas, for the Bugman: most of the bugs he sees daily come across to him via emails – usually in the arena of 140-200 per day. 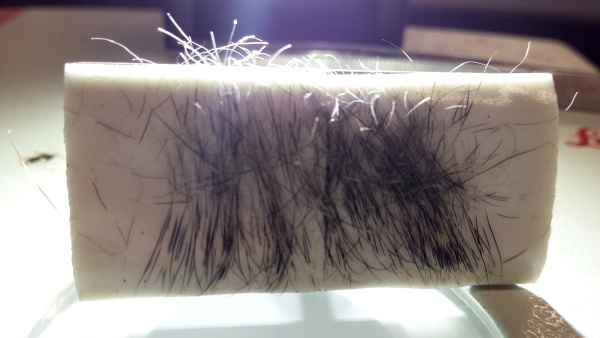 As the driving force behind the internet sensation website “What’s That Bug?” the Bugman response to queries from all over the country from folks who have snapped an unidentifiable bug and whose curiosity demands answers. The Bugman is a nom de plume of David Marlos, a resident of the Mt. Washington area of North East Los Angeles, who has no background in entomology but who does possess a passion for creepy crawlies; thanks to the plethora of insects that inhabit the world, Marlos has managed for the last decade to carve out a secret second life as the Bugman. As a full-time instructor of photography at Los Angeles Community College in their media arts department and occasional part time teacher at Art Center College of Design, Marlos has infused his wit and boundless enthusiasm into the website for more than a decade. Because of the success of the popular website – which drew 2 million people last year from 219 countries – Marlos has just published his first book, The Curious World of Bugs: The Bugman’s Guide to the Mysterious and Remarkable Lives of Things That Crawl from Penguin Group publishing. Marlos will be at L.A.’s Theodore Payne Foundation on Saturday, May 28 discussing his book as well as riffing on insects and sharing buggy tales. “The book is done in the spirit of ‘What’s That Bug?’ but a little more organized,” he says calling it a Farmer’s Almanac-style book that contains short stories, tidbits and facts. Unlike the website though, there are no photos – just wonderful vintage line-drawings of insects which elevates the book into an artistic celebration of the science of insects. The ‘zine moved online in 1998, but over the months it was apparent that Marlos’ column struck a chord with readers. People were sending digital pictures of strange and interesting bugs, insects they found in their homes, while on vacation, hiking or just down the street. Everyone wanted to know “what’s that bug?” and Marlos became the self-proclaimed insect expert.